To operate the device, the switch is left in the open position, the magnets are moved slightly apart and the sliding coil set into various positions with a wait of several minutes between adjustments. The magnets are then separated still further and the coils moved again. This process is repeated until at a critical separation of the magnets, a voltage is developed. The switch is now closed and the process continued more slowly. The voltage then builds up to a maximum which is then maintained indefinitely. The position of the apparatus in the room and the orientation of the device had no effect on the output. The magnets were selected to be as nearly equal in strength as possible and the resistance of the magnet and coil were checked after winding to make sure they were as nearly equal as possible (about 0.33 ohms). As far as I am aware, nobody has managed to produce a successful replication of either of the Hans Coler devices, which is a pity since it seems clear that these devices have the potential to indicate the nature of the zero-point energy field and possibly, how it may be tapped efficiently. Thomas Trawoeger. One thing which is quite certain, and that is the fact that at this point in time, our technical know-how has not yet encompassed the zero-point energy field properly. It is by no means obvious how the Hans Coler device operates, and if we understood the technology properly, we would be able to say with certainty, exactly how and why it operates, and ways to improve it would be obvious. As it is, all we can do is look at it and wonder, possibly try a few experiments, but the bottom line is that we do not yet understand it. This is the normal situation in the early days of any new field of technology. It is also quite usual for pioneers in any new field to encounter a good deal of opposition, mistrust, and generally disheartening treatment from other people. That is certainly the case for Thomas Trawoeger from Austria, who has progressed well in the passive energy field. He has suffered repeated web-based attacks with his display material being destroyed and web sites being made inoperable. So, what makes some people so afraid of Thomas? The answer is that he is experimenting with shapes. That doesn’t sound too terrible does it? Well, it certainly bothers some people, which suggests that he must be on the verge of uncovering a mechanism for drawing serious amounts of power from the zero-point energy field. Thomas is by no means the first person to examine this area, but he is one of the first to consider drawing serious amounts of electrical energy from the local environment using shape and an appropriate detector. Obviously, this is the same area that Hans Coler was investigating, and it appears that Thomas has managed to tap a continuous 8 watts of electrical energy using a wholly passive device. As we are not all that familiar with this type of technology, we tend to dismiss it as being a “crackpot” area, not worthy of investigation by serious scientists. It is actually, very far from being that in reality, and it just indicates our serious lack of technical understanding if we dismiss it out of hand. Two hundred years ago, the idea of a television set would definitely have been considered a “crackpot” pipe dream, far, far away from reality. Today, any schoolchild would be horrified at the thought of a TV set being considered “crackpot”. So, what has changed? Only our level of technology, nothing else. In another two hundred years time, when the zero-point energy field is fully understood, people will look back with a smile at the though of people like us who didn’t know how to draw any amount of energy, freely from the environment, and they will laugh at the thought of burning a fossil fuel to produce energy from a chemical reaction. That, of course, does not help us at all in this time of our ignorance, and we still have to deal with the sort of people who thought that the horse-drawn cart would never be superseded. The scientific method has been established for a long time now. Essentially, observations are made, experiments are performed and a theory is produced which fits all of the known facts. If additional facts are discovered, then the theory needs to be modified or replaced by another which includes all of the new facts. Established scientists find it difficult to adhere to the scientific principle. They are afraid of losing their reputation, their job or their funding and so are reluctant to investigate any new facts which indicate that some of their best-loved theories need to be revised. Fortunately, not being in the business, we can take new facts on board without any problem. In the light of what certain shapes do, this is just as well. Let us see if we can put this in perspective. Consider an intelligent, well-educated person living several hundred years ago. Looking skyward at night, he sees the stars. At that time, the theory was that the stars were fixed to a ‘celestial sphere’ which rotates around the Earth. That was a perfectly good theory which matched the known facts of the time. In fact, the concept matches the observed facts so well that some people who teach Astro Navigation to sailors still find it to be useful in teaching the subject today. If you told the average person of those days, that the stars were not very small but very large indeed, that the Earth is orbiting around the Sun and in fact, the Sun is one of those ‘tiny’ stars, then you would have been considered one of the ‘lunatic fringe’. Next, if you were to tell that person that there were invisible forces passing through the walls of his house and even through him, he would most certainly rate you as a bona fide member of the ‘lunatic fringe’. However, if you then took several compasses into his house and demonstrated that they all pointed in the same direction, he might start to wonder. Now, just to really establish your membership of the ‘lunatic fringe’ you tell him that one day there will be invisible rays passing through the walls of all buildings and that these rays will allow you to watch things happening on the other side of the world. Finally, to complete the job, you tell him that there is a substance called uranium, and if he were to carry a piece around in his pocket, it would kill him by destroying his body with invisible rays. Today, school children are aware of, the Solar System, magnetic lines of force, television and X-rays. Further, as the scientific theory has caught up, these children are not considered part of the ‘lunatic fringe’ but this knowledge is expected of them as a matter of course. The only thing which has changed is our understanding of the observed universe. At the present time, we are faced with a number of observations which do not fit in with the scientific theories of some of the current educational establishments. If we consider these things seriously, we run the risk of being considered part of the ‘lunatic fringe’ until such time as scientific theory catches up with us again. So be it, it is better to examine the facts than to pretend that they don’t exist. 1. In Quantum Mechanics it has been found that some pairs of particles are linked together no matter how far apart they are physically. If you observe the state of one of the pair, the state of the other changes instantly. This happens far, far faster than the speed of light and that does not fit neatly into present theory. 2. If a substance is cooled down to Absolute Zero temperature, it should be completely motionless, but that is not the case as movement can be observed. This movement is caused by external energy flowing into the frozen material. That energy, observed at Absolute Zero temperature is called ‘Zero-Point Energy’. So where does that fit into the theory? 3. There are several devices which are self-powered and which are capable of powering external loads. These things appear to act in defiance to the Law of Conservation of Energy. 4. The Aspden Effect (described below) indicates that current theory does not cover all of the facts. 5. It is now known and fully accepted by science that more than 80% of our universe is composed of matter and energy which we cannot see. 6. Even though our Sun is losing some five tons of mass per second, it radiates more energy than can be accounted for by the fusion of the amount of matter which would cause this loss of mass. 7. The inner core of the Earth is hotter than present theory would expect it to be. These things indicate that there is something in our universe which is not properly covered by current theory. The present theory thinks of space as being a volume which contains no matter, other than perhaps, a tiny amount of inter-stellar dust. And while space can be traversed by radio waves and many other types of radiation, it is essentially empty. This concept is definitely not correct. All of the odd observed facts suddenly fit in if we understand that there is an additional field which streams through all of space and passes unnoticed through all matter. This field is composed of particles so tiny that they make an electron appear enormous. These particles may in fact be the ‘strings’ of String Theory. What is sure, is that this stream of matter contains virtually unlimited energy. It is the energy seen at Absolute Zero as it is continually streaming in from outside the cold area. It flows to us from every direction and the sun being a major source of it, augments the flow we receive during the daytime. This accounts for the variations seen by T. Henry Moray during the night when the energy he was picking up decreased somewhat. This matter stream acts like a very dense gas except for the fact that effects in it have effectively zero propagation time. This accounts for the widely separated particles having what appears to be simultaneous reactions to a stimulus. Einstein’s idea of the speed of light being an absolute maximum is definitely wrong, as has been demonstrated in the laboratory. In the early stages of investigating a new field, it can be quite difficult to work out how to approach it, especially if the field is entirely invisible and can’t be felt. The same situation was encountered in the early days of magnetism as lines of magnetic force are not visible and cannot be felt. However, when it was observed that iron was affected by magnetism, a mechanism was discovered for displaying where the invisible lines are located, by the use of iron filings. Interestingly, the presence of an iron filing alters the lines of magnetic force in the area as the lines “have a preference for” flowing through the iron. Also, the iron filings used in school demonstrations do not show the actual lines of magnetic force correctly as they themselves become tiny magnets which alter the lines of force which they are supposed to be showing. We are still in the early stages of investigating the Zero-Point Energy field, so we have to consider anything which has an effect on this invisible field. 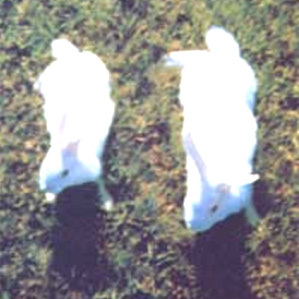 One observed effect was found by Harold Aspden and has become known as the ‘Aspden Effect’. Harold was running tests not related to this subject. He started an electric motor which had a rotor mass of 800 grams and recorded the fact that it took an energy input of 300 joules to bring it up to its running speed of 3,250 revolutions per minute when it was driving no load. The rotor having a mass of 800 grams and spinning at that speed, its kinetic energy together with that of the drive motor is no more than 15 joules, contrasting with the excessive energy of 300 joules needed to get it rotating at that speed. If the motor is left running for five minutes or more, and then switched off, it comes to rest after a few seconds. But, the motor can then be started again (in the same or opposite direction) and brought up to speed with only 30 joules provided that the time lapse between stopping and restarting is no more than a minute or so. If there is a delay of several minutes, then an energy input of 300 joules is needed to get the rotor spinning again. This is not a transient heating phenomenon. At all times the bearing housings feel cool and any heating in the drive motor would imply an increase of resistance and a build-up of power to a higher steady state condition. The experimental evidence is that there is something unseen, which is put into motion by the machine rotor. That “something” has an effective mass density 20 times that of the rotor, but it is something that can move independently and its movement can take several minutes to decay, while in contrast, the motor comes to rest in a few seconds. Two machines of different rotor size and composition reveal the phenomenon and tests indicate variations with time of day and compass orientation of the spin axis. One machine, the one incorporating weaker magnets, showed evidence of gaining magnetic strength during the tests which were repeated over a period of several days. Nikola Tesla found that uni-directional electric pulses of very short duration (less than one millisecond) cause shockwaves in this medium. These Radiant Energy waves passed through all materials and if they strike any metal object, they generate electrical currents between the metal and ground. Tesla used these waves to light glass globes which had just one metal plate. These lights do not have to be near the source of the Radiant Energy waves. He discovered many other features of these ‘longitudinal’ waves but one which is of particular interest is that when using his famous Tesla Coil, the waves produced visible streamers which showed what they were doing. What they were doing was running up the outside of the long inner wire coil, not through the wire, mark you, but along the outside of the coil, and when they reached the end of the coil, they continued on out into the air. Interestingly, Tesla believed that this flow of energy “preferred to run along the corrugations of the outside of the coil”. That is to say, somewhat like magnetic lines showing a preference for running through iron, this energy field shows a preference for flowing along certain physical shapes. Thomas Henry Moray developed equipment which could tap up to fifty kilowatts of power from this field. There are two very interesting facts about Moray’s demonstrations: Firstly, the valves which he used to interact with the field, had a corrugated cylindrical inner electrode - an interesting shape considering Tesla’s opinion on the corrugated outer surface of his coil. Secondly, Moray frequently demonstrated publicly that the power obtained by his equipment could flow uninterrupted through sheet glass while powering light bulbs. Quite apart from demonstrating that the power was definitely not conventional electricity, it is very interesting to note that this power can flow freely through materials. I venture to suggest that Moray’s power was not flowing through the wires of his apparatus but rather it was flowing along the outside of the wires, or perhaps more accurately, flowing along near the wires. Edwin Gray snr. managed to draw large amounts of power from a special tube designed by Marvin Cole. The tube contained a spark gap (like that used by Tesla) and those sparks produced Radiant Energy waves in the Zero-Point Energy field. He managed to collect energy from these waves, very interestingly, by using perforated (or mesh) cylinders of copper surrounding the spark gap. His 80 horsepower electric motor (and/or other equipment such as light bulbs) was powered entirely from energy drawn from the copper cylinders while all of the electrical energy taken from the driving battery was used solely to generate the sparks. It is very interesting to note that Tesla, Moray and Gray all indicate that corrugated or rough-surface cylinders seem to direct the flow of this energy. Dr Harold Aspden also indicates that once the field is set in motion in any locality, it tends to continue flowing for some time after the influence which is directing it is removed. Please remember that we are starting to examine a new field of science, and while we know a very limited amount about it at this point in time, at a later date, every schoolchild will be completely familiar with it and find it hard to believe that we knew so little about it, at the start of the twenty-first century. So, at this time, we are trying to understand how energy can be extracted from this newly discovered field. The indications are that the physical shape of some objects can channel this energy. 6. The kindling will catch light without you even having to touch it. Sounds like something out of a book on magic, doesn’t it? Well, you need to know all about that if you want to pass any basic physics examination, and it comes in under the title of “Optics”. Please notice that the shape of the lens is vital: it must have a convex face on both sides. Also, the positioning is vital, the lens must be exactly its focal length away from the kindling material: a little too near or a little too far away and it just does not work. Magic? Well it may seem like it, but no, it is just scientific understanding of the nature of radiation from the sun. Take the case of a satellite dish. This familiar object needs to be an exact shape to work well. It also needs to be made of a material which reflects high-frequency radio waves. Make one out of wood and it will look just the same but it will not work as the TV transmission will pass straight through the wood and not be reflected on to the pick-up sensor connected to the television set. Method of Maintaining Razor Blades and the Shape of Straight Razors. The invention relates to the method of maintaining of razor blades and straight razors sharp without an auxiliary source of energy. To sharpen the blades therefore, no mechanical, thermal, chemical or electrical (from an artificial source) means are being used. There are various mechanical sharpening devices being used up to now, to sharpen used razor blades. The blade is sharpened by crude application of sharpening material, which always results in certain new wear of the blade during the sharpening process. Furthermore, it is known that the influence of an artificial magnetic field improves the sharpening of razor blades and straight razors, if their blades are laid in the direction of the magnetic lines. According to this invention, the blade is placed in the earth's magnetic field under a hollow pyramid made of dielectric material such as hard paper, paraffin paper, hard cardboard, or some plastic. The pyramid has an opening in its base through which the blade is inserted. This opening can be square, circular, or oval. The most suitable pyramid is a four sided one with a square base, where one side is conveniently equal to the height of the pyramid, multiplied by pi /2. (which is pi or 3.14 / 2). For example, for the height of 10 cm, the side of 15.7 cm is chosen. The razor blade of a straight razor is placed on the support made also of dielectric material, same as the pyramid, or other such as cork, wood, or ceramics, paraffin, paper, etc. Its height is chosen between 1/5 and 1/3 of the height of the pyramid, this support rests also on a plane made of dielectric material. The size of this support should be chosen as to leave the sharp edges free. Its height could vary from the limits stated above. Although it is not absolute necessary, it is recommended that the blade be placed on the support with its sharp edges facing West or East respectively, leaving its side edges as well as its longitudinal axis oriented in the North / South direction. In other words to increase the effectiveness of the device it is recommended lie in essence in the direction of the magnetic lines of the horizontal component of the earth's magnetism. This position improves the performance of the device, it is not however essential for the application of the principle of this invention. After the blade is properly positioned, it is covered by the pyramid placed in such a way that it’s side walls face North, South, East, and West, while its edges point towards North-West, South-West, South-East, and North-East. It is beneficial to leave a new blade in the pyramid one to two weeks before using it. It is essential to place it there immediately after the first shave, and not the old, dull one. But it is possible to use an old one, if it is properly resharpened. The blade placed using the method above is left unobstructed until the next shave. The west edge should always face West. It improves the sharpening effect. Example: When this device was used, 1778 shaves were obtained using 16 razor blades, which is 111 shaves per blade on the average. The brand used was "Dukat Zlato" made in Czechoslovakia. The lowest count was 51, the highest was 200. It is considered very easy to achieve up to 50 shaves on the average. (for a medium hard hair). The following shows how the invention could save both valuable material and money. One of the razor blades mentioned above, weighs 0.51 grams. We will consider 50 shaves on average when placed in the pyramid against 5 shaves when it is not. It is obvious that the number of shaves, degree of wear, and the ability to regenerate the dull edge depends on the quality of the material, quality of sharpening process, and hardness. ....given that the numbers are averages and could be in fact much better. In the course of the year one therefore uses 73 razor blades without the aid of the pyramid while only eight razor blades while using the pyramid. The resulting annual saving would be 65 razor blades or 33.15 grams of steel per person. Only the pyramid shape has been used for this invention, but this invention is not limited to this shape, as it can cover other geometric shapes made of dielectric material that was used in accordance with the invention. And that this shape also causes regeneration of sharp edges of shaving blades by lowering of stresses and reducing the number of defects in the grids of crystal units, in other words recovering and renewing the mechanical and physical properties of the blade. This is interesting, as it confirms by independent test that a pyramid shape produces an effect, even if it is not possible to say with absolute certainty what exactly the effect is and how exactly the pyramid shape manipulates that energy. It should be remembered that these pictures are quite old and all inventors keep working on their inventions in an effort to improve their operation and to investigate the effects caused by alterations. At the close of 2007 the design has progressed considerably and now features a number of most unusual things ranging from construction to orientation. This forum is working on replicating this design thanks to the generosity of Thomas Trawoeger who speaks German and the exceptional work of Stefan Hartmann who has produced an English translation and who hosts the web site. The following is an attempt to present the basic information from that forum in a clear and concise manner, but I recommend that you visit and contribute to the forum if you decide to experiment with this design. The frame of the pyramid is not the same shape as the well-known Egyptian pyramids and has a sloping face some 5% longer than those in Egypt. The materials used in constructing the pyramid are very important. The frame is made of 20 mm x 20 mm x 2 mm square-section steel tube. While the exact size of the pyramid is not critical, the exact proportions are critical. The base must be exactly square, with each side of the base being exactly the same length, 1 metre in this case. The sloping sides are exactly the same length as the base pieces being 1 metre long also. Eight one-metre lengths of steel section will therefore be needed for building the frame. This frame of copper piping is not assembled as shown straight off as there is a requirement for a long graphite rod, 2 to 3 mm in diameter, to be positioned vertically inside each vertical leg of this frame and that can’t be done after assembly. So the bottom section is assembled as one piece, and the top section is assembled separately with the graphite rods sticking down out of the T-sections, held in place by their wires and insulating plugs. The graphite rods can be bought from art materials supply shops. The left hand side hole in the copper pipe is used to inject a 5% salt / water solution, using a hypodermic syringe, until the water starts to come out of the hole at the right hand side. The right hand side hole is 5 mm lower down than the one on the left. Next, a second capacitor is constructed from 1 mm thick copper sheet. Again, sections of copper pipe can be used after being cut along their long axis and carefully opened out and flattened. This capacitor is just two plates 140 mm x 25 mm spaced 1 mm apart (one inch = 25.4 mm). A voltmeter can be used to check the exact alignment of the pyramid. There is a video (with a commentary in German, at http://video.google.com.au/videoplay?docid=-4610658249377461379 showing an earlier version of this pyramid set-up driving an electrical fan taken from a computer). If this device interests you, then you should join the enthusiast research and development forum mentioned earlier. So if the base length is to be 20 units, then the height at the mid point of the base will be 16.17 units. If the base length is to be 25 units (mm, cm, inches, or whatever), then the height should be 20.21 units. If the base is to be 30 units, then the height should be 24.26 units. If the base is to be 35 units, then the height should be 28.3 units, and so on. Just cut out four of the triangles and tape the edges together. It would be a good idea to add a square base piece (or triangular gussets) to ensure that the base is exactly square and not skewed. 2. There is no need for the pyramid faces to be solid, provided that there are four base sides and four sloping edges. Having solid sloping faces gives a slight improvement. If building a framework pyramid, then the dimensions for the four base pieces and the four sloping edges would be: Base: 20, length of the sloping edges: 19 Base: 25, length of the sloping edges: 23.76 Base: 30, length of the sloping edges: 28.52 Base: 35, length of the sloping edges: 33.27 and so on. 3. The best material from which to construct the pyramid is copper, but as it tends to be rather expensive, almost any other material can be used: plastic piping, timber laths, steel alloy pipes, wire, etc. Giving the pyramid a sheet-copper cap which runs down about 5% of the face length, giving a short solid face on the open framework also gives a slight improvement. So, what can a pyramid do? Well, nothing, actually, except for directing and possibly concentrating and focusing the Zero-Point Energy field. Perhaps the question should be ‘what effects are caused by using a pyramid?’. Well, as seen above, Flavio Thomas Trawoeger has managed to get a continuous electrical output via a pyramid for a period of at least thirty days. I understand that he uses a magnet just as an on-off switch, but having a magnet as part of the pick-up makes a lot of sense as the magnetic dipole of any magnet has a distinct effect on the zero-point energy field. The low-tech investigators have noted that an effect caused by a pyramid may be repeated for maybe nine times in a row, and then inexplicably, one day it will not work. They surmise that the effect may be caused by magnetic variations due to solar flares or the like. They may well be right in this as they are not using a magnet but just simple cardboard, or more frequently, simple frame pyramids. This area is wide open to investigation with very low-tech apparatus and passive electronic components. Each of the hutches had a transparent door. He then borrowed eight rabbits aged about 20 days old, taken from two different litters and placed them in matched groups of four in each hutch, and fed them equally, weighing them every four days. James invites you to run this test for yourself to verify that this does indeed occur. It should be noted that as the test ran over a period of 57 days, any days lost through magnetic variation would not have been detected by him. (a) Fruit is preserved. When a purchase of fresh fruit or vegetables is made, if they are placed under a pyramid for about an hour and then stored as they normally would, it is said that they stay fresh for at least twice as long as normal and the flavour is enhanced. It is believed that unhelpful micro-organisms are killed by the pyramid. If the fruit and vegetables are kept indefinitely under the pyramid they eventually dry up instead of rotting. (b) Food quality is enhanced. If frozen meat, fish or fowl is thawed out under a pyramid, the quality of the meat is said to be noticeably improved. (c) Coffee quality is improved. If a cup of coffee is left under a pyramid for about twenty minutes, it is said to gain a much more mellow flavour. Leaving ground coffee or a jar of instant coffee under a pyramid over night is also said to change it so the coffee made from it is of a much higher quality. (d) A glass of wine placed under a pyramid for twenty minutes is said to undergo a distinct change with great improvement seen in both the taste and the aroma. Other alcoholic drinks are also said to be improved by this process. (e) A twenty to thirty minute treatment of fruit juices is said to reduce the acidic “bite” of the drink, and in many cases, alter the colour of the juice. (f) Any item pickled in vinegar, such as olives and pickles, gain a greatly enhanced natural flavour and are greatly mellowed by the process. (g) The rapid growth of mould on Cheddar cheese can be overcome by the cheese being kept under a pyramid at normal room temperature. It is recommended that the cheese be wrapped in plastic to reduce the rate at which it dries out. (h) Rice and wheat can be kept in open jars under a (twelve-inch open frame wire) pyramid for at least four months without any form of deterioration or infestation by insects or flies - which are repelled by the energy inside the pyramid. A test was run outdoors with a six-foot base pyramid with food placed in the centre to attract ants. It was found that ants heading for the food followed a curved path out of the pyramid without ever reaching the food. (I) Water left under a pyramid is altered. Cut flowers placed in it tend to last 30% longer than normal while growing plants watered with it grow more strongly and are hardier. The water appears to hold the energy indefinitely, a glassful takes twenty minutes, a quart (two pints) takes one hour and larger amounts should be left over night. Animals given the choice of pyramid water or untreated water almost always choose the treated water. 3. In the 1940s, Verne Cameron of America discovered that the beneficial pyramid energy could be transmitted. He placed a pyramid at each end of a row of plants, connected a wire to the apex of each pyramid and ran the wire underneath the plants. He placed a clump of steel wool on the wire under each plant. The pyramids were, aligned North--South and he found that even better results were obtained if the row of plants was also aligned in a North--South direction. 4. There are reports of instances where dogs suffering from old age, lameness and hair loss have been cured and rejuvenated in about six weeks by the use of a pyramid. I suggest that the Great Pyramid in Egypt was most definitely not built as just a burial place but that the chamber inside it was used to treat people with large amounts of the energy picked up by the shape of the pyramid. It is also likely that the pyramid was used as a communications device, but that is outside the scope of this presentation. 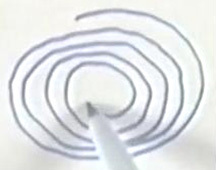 This invention describes a simple technique to convert the energy of a DC electrostatic field into an alternating current by wrapping a coil around a pyramid. The resulting AC current can be rectified and used for practical purposes. A pyramid-shaped capacitor can also be used in an inverse mode of operation for the generation of propulsive force. This invention describes a novel method is of converting DC electrostatic energy into an AC current which can be rectified and used for practical purposes. The shape of the capacitor and the body of such device is designed to convert the DC electrostatic energy into the AC current for maximum effect. A pyramidal or conical shape is preferred for one of the capacitor electrodes. In Fig.1, a detector coil 102 is provided that which connected to an oscilloscope 104. The coil surrounds the metallic pyramid 100. In the experimental set-up shown, the field is established between a top plate 106 and the pyramid 100 by using a ground 108 connected to a source of DC electrical energy 110. 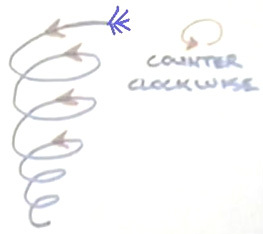 When a high voltage DC field (30 kV) is established on such capacitor, a regularly repeating, clock-like signal is detected in the coil placed on the pyramid's surface (Fig.2). This is an unexpected observation as corona discharges are irregular by nature. The alternating current from the coil can be rectified and used for practical purposes. If a suitable DC electrostatic field could be found in nature, this principle would be useful in tapping the energy of such field. To test for this possibility, I have measured the rectified signal from the coil without an external power source. The rectified coil output was collected in a capacitor and voltage measured at intervals of one hour. The voltage measured is significantly higher if the capacitor electrode is pyramid-shaped as opposed to a box-shaped electrode of the same height and volume. When the pyramid is placed inside a Faraday cage, the signal is excluded (see details in the Example). The data have demonstrated in principle that with this experimental set-up, electrical energy can be extracted from the Earth's electrostatic field. The Earth's surface and the ionosphere substitutes for the two charged electrodes, which exhibit negative and positive polarities, respectively. Demonstration of the pyramid generator: For the experiments, I have selected a one-foot base length foam pyramid from a pyramid vendor (The Pyramid Project, Ft. Wayne, Ind.). The outside of the pyramid was covered with aluminium foil. The pyramid was placed on a 2 foot × 2 foot insulating polyethylene platform equipped with an adjustable height 2 foot × 2 foot size aluminium top plate, 1/16" thick. The height of the aluminium plate was adjusted as needed and a gap of 1.25" between the plate and the tip of the pyramid was used in the experiments. In some experiments, an aluminium pyramid was used with a wall thickness of 1/16". A high voltage (HV) CRT power source producing 30 kV DC was taken from a colour monitor. I have assumed that an actual energy-producing pyramid should be relatively high in order to obtain a large voltage drop from its tip to the ground. Therefore, assuming a height of 100-150 m for a life-size pyramid and a voltage drop of 200-300 V/m near the surface of the Earth, the 30 kV is in the range of the voltage-drop expected for the height of a life-size pyramid. The positive pole was attached to the top aluminium plate. This simulated the positive charge of the atmosphere. One corner of the pyramid was attached to the negative pole of the high voltage power source, while the opposite corner of the pyramid was grounded. This set-up served as a model for the electrostatic field distribution around a potential life-sized pyramid. As controls, either a 1 foot × 1 foot sheet of aluminium foil or an aluminium foil-covered box, having the main dimensions of the test pyramid (1’ × 1’ × 7.625"), was used as a negative pole. The detector coils were made by winding 20 turns of 24 gauge enamel-coated magnet wire, approximately 8 cm in diameter. A Tektronix high-frequency oscilloscope, Model no. 2236 was used for signal analysis. The first sets of experiments were control measurements with a box of the same height and base length as the test pyramid. The detector coil was placed on the top of the box. Measurements were taken with or without the high voltage applied. One corner of the box was attached to the HV power source (negative pole) and the opposite corner to the ground. The same arrangement was used for the flat square (1’×1’) foil. The peak-to-peak signal amplitude for the box was 8 mV and the signal frequency was 2 MHz. For the flat foil sheet, the signal amplitude was 12 mV with a frequency of 1.43 MHz. The signal form was of a decaying sine wave. When the pyramid was tested without HV, the peak-to-peak signal amplitude was measured at 60 mV with a frequency of 2 MHz. When the high voltage was applied, the signal amplitude increased up to 180-200 mV, while the frequency remained at 2 MHz. The pyramid produced signal intensity significantly higher than the controls. The signal is regularly repeating, clock-like in nature (Fig.2). When a metal (aluminium) pyramid of the same size (wall thickness 1/16" inch) was tested in the same high voltage field using the same detection coil, a voltage of 1 to 1.5 V was detected at the frequency of 2 MHz. To collect energy from the coil, a bridge rectifier (1000 V peak voltage at 6 A) was attached to the leads of the coil. The rectified current was fed into a capacitor (1500 microfarad, 250 V DC max. ), and a direct current of 45 V was obtained. This has demonstrated a simple method to convert electrostatic energy into a continuous direct current. An 8-turn coil having an output of 200-300 V AC (peak-to-peak) was also used for energy conversion. The rectified current from the 8-turn coil powered a 0.186 W light bulb (Fig.3). Ideally, the bridge rectifier is made of fast-recovery diodes. Even in the absence of an externally applied voltage, current is always present in the circuit. Charge builds up in the capacitor and 1 V was obtained overnight using the 20-turn coil set-up. Over 48 hours, a voltage of 5 V was measured. Faraday shielding practically prevented the phenomenon. The preferred shape of the pyramid as a charge collector was again demonstrated in further experiments using the 8-turn coil-bridge rectifier-capacitor (1,500 microfarad) assembly placed on the 1 ft base length aluminium pyramid. A same-volume and height aluminium box was used as control. Charging times of 1-2 hours were used under fair-weather conditions. For the pyramid, 550 mV was measured on the capacitor while on the box 100 mV was obtained. This demonstrated the superiority of the pyramidal shape in capturing atmospheric electrostatic energy. It also demonstrated that we could tap into the electrostatic field of the atmosphere and draw electric energy. For the collection of energy, a battery could substitute for the capacitor. You should also check out the pyramid aspects of the cutting-edge work of Paulo and Alexandra Correa as detailed in Chapter 11. In conducting pyramid experiments you should look daily for signs of change and note them meticulously, and above all be patient. Don't plant a seed one day and expect to have a plant six feet high the next. A plant takes just as long to develop inside a pyramid as it does outside, but in time you will see the tremendous difference in size. Also, don't keep moving plants around inside your pyramid during an experiment; leave pots stationary so you can see what the results are. Here, you will see how to make your own pyramids for experimentation; they can be constructed entirely from inexpensive materials equally as well as from costly ones. Cardboard, wire, plywood or anything rigid enough to retain the pyramid shape will suffice. The pyramid does not necessarily have to be solid; in many experiments just the outline shape is sufficient, provided that it is jointed at all corners and at the apex. A pyramid energizer has multiple uses. The one shown above consists of 72 small cardboard pyramids and a top plate of cardboard covered with foil. By placing the top plate on top of the pyramids and orienting the entire energizer to magnetic north, you can use the energy generated for such purposes as mummification, energizing water, or as a beneficial surface on which to place growing plants for outstanding growth. Remember that with all types of pyramids, positioning is all-important. One of the sloping sides must at all times be facing towards magnetic North - not a corner but the flat face of the pyramid must face magnetic North. Use a compass to determine the direction of magnetic north which will be nearly in line with the Pole star, (but not quite). In this respect, a pyramid is like a radio. For maximum performance you must tune it in properly, pointing it right at the transmitter. Similarly, several pyramids with one face towards magnetic North and stacked on top of each other will produce increased energy, cell activity and growth. Using pyramids, I sincerely believe that I can grow 36 times more and better plants in a given area than any farmer or market gardener can in the same area, using conventional methods. 1. Choose the length "A" of one side of the square base. 2. Draw a square on paper, using your chosen measurement. 3. Divide the square into four quarters. 4. Draw a diagonal "B" across one of the small squares and measure it. 5. Mark that measurement from the base up the centre line. 6. Finish off the triangle by joining the top of line "B" to the two ends of the base "A". 7. When you look at the triangle you have just drawn, it may look too tall, but don't forget that it has to lean inwards to join with the other three sides. When all four sides are put together you will have a pyramid which is the right height and leaning in at 51 degrees, 51 minutes, 14 seconds. This method can be used for a pyramid of any size. The energy inside the pyramid is said to come down through the peak and continues coming in until it reaches a certain intensity, or the limits of safety, at which point the pyramid releases all the energy and begins collecting it again. The pyramid is said to release 80% of its energy through the peak and the other 20% via the four base corners. Only a pyramid performs this way, and even then the maximum performance is obtained only by a perfect pyramid. So, when you start to build one, aim at perfection. The nearer you can get to a perfect pyramid, the more you will benefit. You can grow bumper crops with the use of a pyramid. Anything growing beside an iron fence will be bigger and better than one nowhere near metal. The reason is that the iron fence picks up static or magnetic energy and feeds it to the plant. I remember my mother and grandmother placing large nails in the soil of their potted house plants because plants thus treated always grew bigger and better. They had no idea why. In fact, if you asked them, the standard answer was that, as the nail rusted, the plant fed on it. This reasoning is fallible, however, because for one thing, plants can only absorb minerals in liquid form and for another, the rust would kill some plants. Rather, the nails picked up the magnetic energy and boosted the house plants' growth. When a plant receives an extra dose of energy to that already floating free in the atmosphere, that dose acts as a stimulant and causes better growth. What really happens is that the living cells are increased in size, and naturally when each cell is larger, since there are still the same number of cells, the final plant is a lot larger than normal. If you grow a plant in a pyramid, it absorbs energy at a much higher intensity than that produced by the nails in the plant pots, and so the end result is enormous growth. When this is applied to vegetables and fruits, the plants, as well as their products, are immensely oversized. My own experiments have convinced me that this energy creates a special reaction in living cells of plants, resulting in larger blooms, leaves and fruits on whatever plants are propagated within the pyramid. The normal life cycle of lettuce, for instance, from seed to maturity, is six to eight weeks. Grown under a pyramid the life cycle is still the same, but the plant is considerably larger. If one allows the vine type of tomato to mature to six or seven trusses under a pyramid while simultaneously allowing an identical plant to do the same outside the pyramid, giving both plants precisely the same feeding and watering, a startling difference in yield occurs. I should mention that if you put your outside plant too near the pyramid, it will reach for, and receive, some of the pyramid's energy, so keep it well away to get a fair test. The outside tomatoes would weigh out at approximately 10 to 14 pounds per plant, whereas the plant grown in the pyramid would produce between 50 and 60 pounds of tomatoes. Not every type of plant grown under a pyramid will produce this increase; this is the average that I have come to expect from tomatoes. A few more averages I have obtained repeatedly were: lettuce two to three times larger than average; beans 25 inches long by 1.25 inches wide; cabbage - when controls were three pounds each, the pyramid-grown plants were 12 to 13 pounds per head; radishes that normally would be the size of a quarter were four inches in diameter; controlled cucumbers that averaged 14 inches in length and weighed up to one pound normally, were 21 inches long and weighed up to four pounds when grown in the pyramid and the pyramid also warms your whole house and cleanses the air which you breathe. Energised air in the pyramid also appears to repel small insects; though, there is no need for pesticides to be used within its glass walls. Pest-free plants grow to maturity inside, with none of the setbacks plants subject to normal attack from pests suffer in the garden outside. This also means that pyramid-grown vegetables need no washing upon harvesting. The mere appearance of such plants is more appetising than that of those grown normally. Greens are more vivid, and many leaves have a sheen which is noticeably absent from plants in kitchen gardens. Artificial fertilisers will never be used in my pyramid. Since many fertilisers apparently are becoming short in supply themselves, the ability to grow plants without their use is a double blessing for all mankind. I will use natural farmyard manures, the best way to regain the succulent taste and nutrition which are missing from plants grown with chemical fertilisers. An egg broken out of its shell and left within the confines of the pyramid will gradually congeal and become like plastic, as the interior energy works on its cells - harmlessly. The cells do not die nor induce putrefaction. After a period of even weeks or months these congealed eggs can be reconstituted in water to the point where they can be eaten with complete safety, and they taste even more delicious than eggs produced in the usual way. One peculiar phenomenon which I have observed under my large pyramid is the formation of dew on the plants inside it. This happens early in the morning. During all my years of experience with greenhouses, I never noticed dew forming on any plants in conventional greenhouses. This dew gently dissipates as the sun grows stronger, exactly as it would outside. Also, after a recent thunderstorm, my pyramid cucumbers grew two to two and a half inches in a matter of a few hours. I built a pyramid purely for research purposes. For large-scale production, one which is much greater in size would be needed. When building the prototype, I encountered and overcame, virtually all the problems one can expect to meet in a construction of this type. Building a pyramid is nothing like building a house, and while a slight difference in measurements can be overcome when building a house, it is not possible to make a mistake in a pyramid and just carry on building. The particular piece containing the error must be pulled out and replaced correctly, as any mistake is transferred all the way around the pyramid. My test pyramid is 30 feet high along a perpendicular line from ground to peak. The sides from base corner to peak measure 44 feet 4.5 inches, with a baseline of 46 feet 10.5 inches. It contains two additional floors above the ground level, and the sum of the areas of these two floors equals or is greater than that of the ground floor. Thus, the two additional floors virtually double the growing area. My first floor is 12 feet above the ground, and there is a reason for this. I calculated that when the sun was at its highest point the first floor would have to be positioned at 12-feet high so as to allow the sun to shine on to the back north edge of the ground floor. The 12-foot height was perfect, its achievement resulting from a mixture of good judgment and a bit of luck. However, I would not need to build a growing level at this height again because there are as many plants that grow well in shade as there are those that prefer growing in the sun. In future, my floors will all be eight feet apart, and I will put my sun-loving plants in the southern half and my shade-loving ones in the back northern half. By placing the floors at eight-foot intervals there is much more growing area available than there is in placing the first floor at a 12-foot height. In addition, choosing this lower height allows the upper floors to decrease more slowly in size than they would if placed farther apart. Obviously, as the peak of the pyramid is approached, the floors decrease in area. One of the benefits obtained with these extra floors is that since heat rises, there are higher temperatures on each floor nearer the top of the pyramid. This allows a wide range of crops to be grown. To illustrate the temperature difference, if the ground floor were 75o F, then the second floor would reach a temperature of 90o F, and the third floor would be around 105o F to 115o F, each floor having higher humidity. This means that anything from cool to tropical crops can be grown within one pyramid. The ground floor is perfect for such crops as radishes, lettuce, carrots, beets, tomatoes, etc., while the second floor is ideal for cucumbers, squash, peppers, and plants which like it hotter and more humid than the first floor. The top floor can be used for lemons, oranges, figs and especially, orchids. The pyramid draws in its own water on the ground floor; I have never had to water that level being built directly on the ground. It never draws too much or too little water, always just the right amount for growth. Naturally, I have to pump water to the upper floors, but because the first floor provides its own water supply, at least half of my pyramid is watered for nothing automatically. I grow right in the ground the pyramid stands on, but upstairs I have placed wooden planting troughs all around the floors, leaving room to walk, and I grow plants in these. It is a major job getting the soil to the upper floors initially, but it is only a one-time task. The troughs are 16 inches deep and 14 inches wide, and contain a bottom. There is a run all around the edge of each of the upper floors and another inside, leaving enough room to work, with a gap on each side allowing passage from one run to the other. Space in the pyramid is used to the utmost. At the perimeter of the low areas, I plant the kind of plants that need little headroom, and then plant bigger crops toward the middle. This is a matter of common sense, but using vine type tomatoes and stringing them up, one can work between the rows better, and if the lower leaves are removed, there is sufficient space to grow lettuce, cabbage or any low-lying crop in between the tomato plants. The trusses may be left on the tomatoes; they will not shade the low-lying plants. To ensure a steady supply of food, it is wise to plant only a few plants of each variety at intervals, which means that in the beginning it will take several weeks to reap a full harvest, but subsequently there will be a continuous yield. By planting in such a manner, the grower will reap about six full crops each year. This method applies only to an enclosed pyramid, which would also require heating in the winter. The means of heating is up to the individual. Personally, I use a wood stove because I have my own wood supply. However, a wood and oil combination is best because it allows one to be away for a couple of days when necessary. If the wood fire gets low, then the oil burner takes over. As for growing potentials of the floors of the pyramid, I have found that the second floor is the best place for germinating new seeds. I find that I can get germination in three days on that floor, whereas it usually takes five days otherwise. Thus far I have described the pyramid from the growing aspect only to the point of showing you how and where to grow crops, but let's take a look at a few statistics on production. Your garden, for instance, will only give one crop a year, but the pyramid through the means I suggest will give you six crops per year. Now let's compare two pieces of ground, both the same size, one with a pyramid on it. Say the garden is 50 feet square and the pyramid is 50 feet square. The upper floors inside the pyramid give you approximately 2,500 square feet of growing area upstairs to go along with your ground floor area of 2,500 square feet, and you are getting six crops per floor as opposed to one, or twice times six, the equivalent of 12 times your garden yield. Nor is that all of the advantage. Recall my discussion of the increase in size of the plant cells; this itself gives an average of three times the size of a normal crop. Multiplying the 12 times by the size of the crop, you are 36 times better off than with a single garden. In addition to food growth, the pyramid also has application in food preservation. I have read statistics stating that 40 percent of all food grown in my home country of Canada is lost to putrefaction, whether at the place of storage, in transport, in wholesale and retail, or finally in the home. Regardless of how this spoilage occurs, this state of affairs can be remedied. The energy of the pyramid which grows plants so amazingly well, can also be used for the purpose of mummification of food, which can be dehydrated and kept in storage for an indefinite period without losing any of its taste or nutritional properties. There are absolutely no ill effects on any food stored in a pyramid. In fact, in many instances it is far better when reconstituted than it was in the first place. It has the water taken out of it; but it also repels bacteria and as a result, nothing will rot in a pyramid. For instance, I cannot make a compost heap inside my pyramid; I have to do it outside; otherwise the ingredients in the compost all remain in good shape and will not break down. For further proof, the grain grown in Manitoba today is a direct descendant of the grain found in the Great Pyramid, grain that had been there for centuries and had kept perfectly. Earlier I mentioned mummifying eggs. 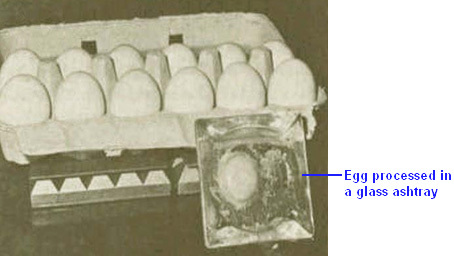 I conducted an experiment in mummifying an egg, using a pyramid energizer instead of a single wire pyramid. The energizer consisted of a small batch of one-inch-high pyramids, 20 in all, positioned in a group. Using such a grid of pyramids provides quicker results than using just one pyramid. I broke an egg into a dish, placed the dish on top of the energizer and observed what happened in the ensuing days. In about six hours I noticed the lower perimeter of the yolk turning a pale yellow, and this continued through each day, the pale colour gradually moving up to the top of the yolk. In the meantime, the white was becoming less fluid, thickening, so to speak. In two weeks the whole egg was just like glass; the yolk was hard and the white was now in crystal form. At no time would flies or any insect approach it, even though it was open to them. Flies were as prevalent as usually, but they would not go near the egg. There was never any smell present from start to finish. I left the egg in this state for about three months and showed it to many of my visitors, but then it was time to reconstitute it and try it for taste. I added some water (an egg loses about 30 grams of water in such a period) and left it 24 hours. I then boiled some water with the intention of poaching the egg. When the water was ready, I tipped the egg in, and immediately the albumen turned snowy white and the yolk a perfectly natural yellow colour. Had I dropped the egg before reconstituting it, it would have shattered, but now it was simmering away, looking just like a fresh egg. After cooking the egg I put it on a plate, salted and peppered it, then cut the yolk through with my knife, and it flooded across my plate. I admit I was not in too big a hurry to eat it, but if I was going to prove something, I had to taste it. I smelled the egg, and it was no different from normal, so I ate it. I can honestly say it was one of the nicest eggs I have ever tasted; it seemed to have more flavour than usual. I do not know of any food that cannot be treated in such a manner. I have tried preserving every food I can think of, and it all keeps indefinitely, with no refrigeration necessary. Since publicity was first given to my large, wooden pyramid some three years ago, I have been inundated with letters, phone calls and personal visits. People from all walks of life and many different places in North America and Europe and indeed a few from further afield - Australia, Africa and the East Indies - all have expressed an interest and have given me kind encouragement. Many of these letters, calls and visits have had as their objective the gathering of practical information on the building of pyramids and the problems likely to be encountered. My pyramid is made from rough sawn timber, cut on and near my own property and milled by a neighbour. But it is not necessary for pyramids to be made of wood. They can be made of any rigid material which will support permanent glazing: cardboard, strong wire, sheet steel or metal, angle irons, logs - anything which will not curve and that can be precisely measured and fitted. Nor do pyramids have to be solid for many uses; open-sided shapes will do, so long as all corners are joined and the angles are correct. My present pyramid is made of timber and covered with heavy-gauge plastic sheet. Future ones will be sheathed in fibreglass, acrylic or glass. They will be closed pyramids solely because I propose to grow food during the depths of Canada's frigid winters. He then decided to connect the two coils together using a strand of natural wool, so he tied it to the bottom of the coil at the apex. He climbed down the ladder and standing on the ground, he took hold of the piece of wool and was thrown several feet away by the energy flowing through the wool. This frightened him so much that he took the pieces apart and never investigated that type of arrangement ever again. He believes that it was because he was grounded when he grasped the wool, that there was such an energy flow through him. If you decide to try this with a smaller pyramid, then I suggest that you connect the wool to the lower coil first, making the earth connection that way, before tying it to the upper coil. However, let me stress again that we just don't know what is happening in and around the pyramid, so any experiments which you choose to carry out are entirely your responsibility and at your own risk. Although a good deal of practical information is given here, it must not be construed as being a recommendation that you make or use any of the devices described in this document as the presentation is for information purposes only. Les Brown mentions other uses for the devices which he has developed. He says: My wife, who suffered from migraine headaches, had a severe attack for a week; and during that time she took an abundant supply of pills, which proved to be of no benefit. She placed a pyramid on her head in the early hours of the night, and in about 20 minutes had been relieved of all pain. She said nothing of this to me, but two weeks later suffered another headache. Instead of suffering for a lengthy period, she used the pyramid again, and without the use of pills the headache vanished again in about the same length of time. She told me about this second episode. About a week later she suffered an ordinary headache and repeated the performance, with the same result. She now has gone three years with no headaches at all. Around this time, I had been working all day in the hot sun, and the back of my neck became quite painful. I tried placing a small pyramid on the back of my neck while I sat still for a while. It produced the same relieving results for me. I believe it increases blood circulation to the affected part. After about ten minutes I could feel the pain being drawn out upwards. At the same time my head felt cold on top, not cold to the touch, but simply felt cold to me. I mentioned this to my wife, and she said she had had the same sensations of coldness but was waiting for me to remark about them first. I am not suggesting that this treatment will do the same for everyone, but merely mentioning that it worked for us. The elderly mother of a friend of mine, her hands badly crippled with arthritis, was persuaded to place her hand on an energiser. A wire pyramid was put over both hand and energiser for one hour. She continued this treatment for a few days, experiencing a diminution of pain and a loosening of her fingers each time. Before she returned to her home in England she actually sat and played the organ. She played haltingly and rustily, it is true, but she had been unable to play at all for several years prior to using the pyramid. Significantly, her hands returned to their crippled state shortly after she returned to England as her pyramid was stolen at London Airport. We also find that when we are feeling low and depressed, my wife and I sit for an hour or so, each with a small pyramid on our head, facing North, our depression lifts and we feel quite rejuvenated. My wife and I regularly drink pyramid-treated water. If we are feeling low we have a snifter of pyramid water and in a short time we feel a marked lift. On the other hand, if we find ourselves in what used to be described as a choleric state and sit with the pyramid on our head - but facing south -our irritability rapidly leaves and is replaced by a state of calm. A prominent acquaintance of mine who does not wish to be named, always drives with a pyramid under his car seat. He claims he feels less "bushed" after a long drive than he did before using a pyramid. Many investigators have found that by putting a pyramid or an energiser over, or under, their beds, they experience better and more refreshing sleep, some of them claiming they need far less sleep than they required before using a pyramid for this purpose. The real keynote when trying these pyramid experiments is persistence. As with many other experiences, pyramids do not always "work" the first time you apply one to a situation, and a person must "stay with it" and make subtle corrections until the desired results are obtained. Putting energized water into a vase containing tulips caused them to last for about three and a half weeks. Not only did they last this phenomenal length of time, but they grew about nine inches during that period ! I have never before seen flowers grow after having been cut. Many people claim that insect stings stop itching after the application of energised water; this has been our own experience. On one occasion I had a nasty cut on my hand. Immediately after washing it with pyramid water, the pain stopped and when it was fully healed, I had no scar. The cut also healed much more quickly than is "normal" for me. Please be aware that the energy channelled by pyramids and the Joe Cell described below is very powerful and more than capable of running a vehicle without the use of any kind of visible fuel. Dealing with this power is not an established science and we are just blundering around the edges of a science which has not been properly investigated, so at this time it is a case of discovering what tests have been carried out and analysing the results to see if there is a solid pattern leading to repeatable tests which can be performed by anyone. We are at about the same place as the Wright brothers were in 1903 just after their successful powered flight at Kitty Hawk. They took their "Flyer" back to Dayton, Ohio and discovered that it wouldn't fly. The problem was not immediately obvious to them. Being down at sea level and in an uncomfortably high wind, was essential for their device to be able to get off the ground, but understanding why and how to overcome the problem was not immediate as the theory of practical heavier-than-air flight was not established at that time. The same situation applies today to pyramid power. The power is definitely there but the methods of controlling it, channelling it and getting it to perform useful work for us is not yet established. The Joe Cell. In my opinion, the device called the “Joe Cell” is one of the most difficult devices for any experimenter to get operating properly. It is a passive device for concentrating energy drawn from the local environment and it takes great perseverance and patience to use one to power a vehicle. However, a few people have had success with these devices, so here is some practical information on the Joe Cell. In 1992 in Australia, Graham Coe, Peter Stevens and Joe Nobel developed previously patented units which are now known by the generic name of the “Joe Cell”. Peter introduced Joe to Graham and they rehashed the patented cells which Graham knew about, using materials from the Local Dairy Production Facility NORCO. A two hour long video showing the Joe Cell was produced by Peter and Joe and the unit shown operating in the video was attached to Peter’s Mitsubishi Van. Joe had his equipment stolen and his dog killed, so he decided to keep a low profile, moving out into the wilds and not generating much publicity, in spite of fronting the two hour video recording. A search on the Joe Cell will locate many videos on the subject. This document is an attempt to provide detailed information on a recent Cell built by Bill Williams in the USA and the subsequent constructional advice which has arisen from his experiences. 1. Buy a canvas, if one is not available, then here is how to make one. 3. Buy an artists brush, palette and charcoal, if none are available then this is how you make them. 4. Here is how you paint the picture. Even given the most complete and detailed instructions, many people, including myself, are unlikely to produce a top-quality copy of the Mona Lisa. It is not that the instructions are lacking in any way, it is the skill and ability of the person attempting the task which are not up to the job. Please understand that not everybody who builds a Joe Cell will have instant success. Some people will get perfect results straight off, but others will have to go through a process of persevering and tinkering, and some will give up before they are successful. This applies to any category of Joe Cell. A Joe Cell is capable of powering a vehicle engine without needing to use conventional fossil fuel. So, what does the engine run on? I suggest that it runs on a newly discovered energy field not yet understood by mainstream science. In another couple of hundred years time, it will be a routine subject which every child in school will be expected to understand, but today it looks like the ‘witchcraft’ of the magnifying glass starting a fire. It is not unusual for newcomers to the subject to get confused by the Cell itself. The Cell consists of a metal container with tubes inside it. The container has what looks like ordinary water in it and it sometimes has a DC voltage applied across it. This causes many people to immediately jump to the false conclusion that it is an electrolyser. It isn’t. The Joe Cell does not convert water to hydrogen and oxygen gasses to be burnt in the engine. The water in a Joe Cell does not get used up no matter how far the vehicle travels. It is possible to run a car on the gasses produced by electrolysis of water, but the Joe Cell has absolutely nothing whatsoever to do with electrolysis. The Joe Cell acts as a concentrator for a new energy field, in the same way that a magnifying glass acts as a concentrator for sunlight, and both have to be done just right for them to work. At the present time, there are at least fifteen people who have built Joe Cells and managed to power vehicles using them. Several of these people use their Joe Cell-powered vehicles on a daily basis. Most of these are in Australia. The first Cell-powered vehicle was driven some 2,000 kilometers across Australia. Disclaimer: The remainder of this document contains considerable specific detail on the design and construction of a Joe Cell. This presentation is for information purposes only and must not be construed as a recommendation that you actual physically construct a device of this nature. The author stresses that he is in no way liable for any damage, loss or injury caused by your future actions. It should also be borne in mind that any alteration to an automotive vehicle, such as changing the fuel on which it runs to hydroxy gas, natural gas, Joe Cell energy, or anything else, might void the vehicle insurance unless the insurer is informed beforehand and agrees to continue insurance cover on the modified vehicle. In broad outline, a Joe Cell is a 316L-grade stainless steel container, with a central cylindrical electrode, surrounded by a series of progressively larger stainless steel cylinders, and filled with specially treated water. This arrangement of steel shells and treated water acts as a focusing mechanism for the energy field used to power the vehicle. The Cell itself is made up with the battery negative taken to the central electrode. The connection to this stainless steel electrode is made at the bottom with the electrical connection passing through the base of the cell container. This obviously needs careful construction to prevent any leakage of the conditioned water or the energy focused by the Cell. The picture above shows the general construction of a cell of this type although, unlike the description below, this one does not have the lip which is used for attaching the lid. It is included here just as a general illustration of how the cylinders are positioned relative to each other. 1. The Materials needed for Construction. The Materials needed for Construction. Various vehicles can be powered by a Joe Cell. If you have not built and used a Joe Cell before, then it is worth using the easiest type to convert. The most suitable is an older type vehicle with no computer control of the combustion, a carburettor and a water-cooled engine. If the engine block is aluminium rather than steel then that is also a slight additional advantage. The Cell is built from stainless steel pipes. The lower the magnetism of the finished unit the better, so 316L grade stainless steel is preferred. However, there is no need to become obsessed with this as most varieties of stainless steel can be persuaded to operate. The length of the tubing is not critical, but about 8 inches (200 mm) is a reasonable choice for the overall length of the inner tubes. The outer pipe which forms the casing, needs to be about 10 inches in length so that there is clearance above and below the inner pipes. The innermost pipe diameter is 2 inches (50 mm) and the others can be 3 inch, 4 inch, and 5 inches in diameter as that creates a gap of just under half an inch between the pipes, which is a suitable spacing. The wall thickness of the pipes is not critical but it needs to be a practical size with 1 mm being the minimum thickness with the most common thickness being 1/16 inch (1.6 mm or 0.0625 inch). It is important that the walls of the outermost cylinder are completely rigid, so using a greater thickness for that cylinder is an advantage. Some stainless steel plate is needed for the ends of the outer cylinder. Ideally, the top and base should not overhang the sides but that is difficult to achieve if the cell is to be airtight, so the end pieces will need to be slightly larger than the outside tube and 1/8 inch (3 mm) thick sheet is suggested. The base size is 5 inch square, or possibly slightly larger to facilitate cutting a circular shape out of it. The lid and lip blanks will need to be 6 inch squares, or again, slightly larger to facilitate cutting circles out of them. The plinth component at the base of the 2-inch inside tube needs to be cut from a piece of stainless steel. If the option of machining the whole plinth as a single piece is chosen, then the piece of 316L stainless steel needed to do this will be substantial, perhaps a section of solid bar 2.25 inches (57 mm) in diameter and some 3 inches (75 mm) long. If the easier and cheaper option of using a standard half-inch (12 mm) 316L stainless steel bolt (if one is available) is selected, then a piece of 316L stainless steel some 2.25 inches (57 mm), or slightly larger, 2 inch (50 mm) thick will be needed. The exact details of this will need to be discussed with the person who will undertake the machining as practical issues come into play, and the optimum size will depend to a certain extent on the lathe being used. If a screw thread is being machined on the spigot of the plinth, then the thread should match the locally available nuts, unless nuts are also being made up. Some additional steel will be needed for constructing a mounting bracket inside the engine compartment, also, some double-laminated hessian sacking (“burlap”) and about 36 inches (1 m) of half-inch (12 mm) wooden dowel to use in the mounting bracket. Some Ultra-High Molecular Weight Polyethylene material as found in kitchen chopping boards will be needed to insulate between the engine mounting and the cell and between the inside tube’s plinth and the base plate. A length of aluminium tubing typically three quarters of an inch (20 mm) in diameter will be needed for connecting the Cell to the engine, and a short length of strong, clear plastic pipe for the actual final connection to the engine, needed to prevent an electrical short-circuit between the Cell and the engine. This plastic pipe needs to be a tight push-fit as clamping clips are not used. A stainless steel compression fitting to fit the pipe is needed to make the seal between it and the lid of the Cell. It is very important that this fitting is stainless steel as other materials such as brass will prevent the cell from operating. The wrong material for this fitting has been the reason for many Cells not operating. Neither brass nor any other material (other than stainless steel) should not be used anywhere in the construction, whether it be for nuts, bolts, fittings, metal connections, or anything else. Ideally, natural rubber with no additives or colouring, failing that “Buna-n” (nitrile rubber) o-ring, or teflon, is needed for inter-cylinder bracing and some sheet to make the circular lid gasket. Also some white marine-grade Sikaflex 291 bedding compound. Natural rubber with no colouring or additives is the best insulator and should be used if at all possible. After extended use, Bill has found that teflon spacers work better than the rubber and so has switched to teflon. Seven or eight stainless steel cones will be needed for the water-conditioning process. These are usually manufactured for machines which separate cream from milk and it is possible to buy them via eBay from time to time. If none are available, then it is perfectly possible to construct them yourself. One plinth blank as described above, size depending on the lathe and style of construction. Don’t polish the tubes and never, ever use sandpaper or wet-and-dry paper on any of these components as the result is scored surfaces and each score reduces the effectiveness of the Cell. The Joe Cell looks like a very simple steel construction which could easily be made by any amateur. While it can be constructed by an amateur, it is not a simple construction as it is important to keep any acquired magnetic properties to a minimum. Consequently, it is suggested that an angle grinder is not used for any of the metalwork, and hand tools used for cutting and shaping. Also, if the cutting tool has previously been used to cut anything other than stainless steel it should not be used, or at the very least, thoroughly cleaned before use as contamination of your Cell components through particles of another material is critical and can prevent the Cell from working. It should be stressed again that the materials used in the construction of a Cell are absolutely critical if success is to be assured. If you have an experienced friend who has made many Cells work, then you can experiment with different materials, but if this is your first Cell and you are working on your own, then use the exact materials shown here and don’t end up with a Cell which doesn’t work. Bill Williams started building a 5 cylinder cell comprising 1", 2", 3", 4" and outer tube 5" but Peter Stevens later advised him to remove the 1" centre tube and go with only two neutrals being the 3” and 4" tubes as the 1-inch diameter is too small for optimum energy pick-up. Please accept my apologies if the following suggestions for construction seem too basic and simple. The reason for this is that this document will be read by people whose first language is not English and who will find it much easier if plenty of detail is provided. The washers which fit into the hole in the base plate need to be slightly less than half the thickness of the plate so that they do not actually touch when clamped tightly against the base plate, as shown in the lower part of the diagram. Cut another washer, using the full thickness of the plastic sheet. This will act as a spacer. Next, the plinth for the central 2-inch diameter cylinder needs to be made. This is the only complicated component in the construction. It is possible to make this component yourself. The local university or technical college will often be willing to allow you to use their lathe and their staff will usually do the job for you or help you to do it yourself. Failing that, your local metal fabrication shop will certainly be able to do it for you. If all else fails and this equipment is just not available, then the ‘workarounds’ section below shows how to fabricate an alternative version which does not need a lathe. A large piece of 316L stainless steel needs to be machined to produce the plinth shown below. The actual 2-inch diameter central cylinder needs to be a tight push-fit on the top of this component. To facilitate assembly, the central boss is given a slight chamfer which helps alignment when the tube is forced down on top of it. Peter Stevens recommends that tack welds (in stainless steel using a TIG welder) are used to connect the plinth to the outside of the cylinder. Three evenly-spaced vent holes are drilled in the plinth to allow the liquid inside the Cell circulate freely inside the central cylinder. This arrangement looks more complicated than it really is. It is necessary to have a construction like this as we want to mount the innermost tube securely in a central vertical position, with the battery negative connected to the cylinder, by a connection which is fully insulated from the base plate and which forms a fully watertight seal with the base plate, and to raise the central cylinder about one inch (25 mm) above the base plate. Cut a six-inch (150 mm) diameter lid out of 1/8 inch (3 mm) stainless steel. Cut a matching ring gasket of natural rubber (Buna-n material if natural rubber can’t be obtained), place it on top of the flange with the lid on top of it and clamp the lid firmly down on the flange. Drill a hole to take a 1/4 inch (6 mm) stainless steel bolt, through the lid and the middle of the flange. Insert a bolt and tighten its nut to further clamp the lid in place. An alternative to this for the more experienced metalworker, is to drill a hole slightly smaller than the bolt, and when all holes have been drilled, remove the lid, enlarge the lid holes to allow free passage of the bolts, and cut a thread inside the flange holes which matches the thread on the bolts to be used. This gives a very neat, nut-free result, but it calls for a greater skill level and more tools. The lid can be finished off by drilling its centre to take the fitting for the aluminium pipe which will feed the output from the cell to the engine. This fitting, in common with every other fitting must be made of stainless steel. Place similar insulators at the other end of the two-inch pipe, directly above the ones already in place. If you look down the length of the tubes, then only three of the six insulators should be seen if they are correctly aligned. The spacers will be more effective if the ends are given a thin layer of the Sikaflex 291 bedding compound before the ends get compressed against the cylinder walls. Spark off each of the cylinders in the inner assembly. This is done by connecting a 12V battery negative to the inside surface (only) at the bottom of the tube and with a wire from the battery positive, sparking the outside surface of the cylinder at the top of the tube. Give each four sparks in rapid succession. If you are using a bolt rather than a machined spigot, insert the stainless steel bolt and washer through the bottom of the base to the central pipe. Wedge the bolt in place by inserting a piece of the dowel, or some similar material into the centre of the 2-inch pipe and tape it temporarily in place. Alternatively, force the innermost cylinder tightly over the machined plinth. Turn the inner pipe assembly upside down and place the full-depth UMWP plastic washer on the threaded shaft. Apply a thin layer of white Sikaflex 291 bonding compound to the face of one of the shaped UMWP washers and place it on the threaded shaft with the bonding compound facing upwards. Carefully clean the surface of the base plate of the outer casing around the central hole, both inside and outside. Under no circumstances use sandpaper or wet-and-dry paper, here or anywhere else, as these abrade and score the surface of the steel and have a major negative effect on the operation of the Cell. Carefully lower the 5-inch outer casing on to the assembly so that the threaded shaft goes through the central hole and the shaped washer fits tightly into the hole in the base of the outer housing. Apply a thin layer of the bonding compound to the face of the second shaped washer, place it over the shaft of the bolt and press it firmly into place to completely seal the hole in the base plate. Add a stainless steel washer and bolt and tighten the bolt to lock the assembly together. If using a bolt, a long-reach box spanner may be needed inside the central pipe for tightening the locking bolt. If one is not available, use a longer bolt through the washers, screw a second nut up on to the shank of the bolt, file two flats on the end of the bolt, clamp them in a vice to hold the bolt securely and tighten the locking nut. When the spare nut is unscrewed, it pushes any damaged fragments of the bolt thread back into place. Finish the assembly by adding three further rubber insulators between the top of the 4-inch tube and the outer 5-inch casing. Use a thin layer of Sikaflex 291 bonding compound on the cut faces of the insulators as this improves the insulation. Line the new insulators up with the insulators already in place and make them a tight fit. These extra insulators support the end of the tube assembly and reduce the stress on the plinth fitting at the base of the central tube when the unit is subjected to knocks and vibration when the vehicle is in motion. The construction of the basic unit is now complete, with the exception of the lid fitting for the aluminium pipe which feeds the engine. The construction so far has been straightforward engineering with little complication, but the remaining steps in getting the Cell powering a vehicle are not conventional engineering. If you do not feel confident about this construction, then advice and help can be got from the experienced members at the Yahoo forum or alternatively, the companion forum both of which are very active. The Cell is not just the container and the inner tubes. A major active ingredient of the “Cell” is the liquid placed inside the container. To a casual glance, the liquid appears to be water and loosely speaking it is water. However, water is one of the least understood substances on the planet. It can have many different molecular configurations which give it widely different characteristics. For example, in one configuration, it will actually burn, but this “burning” is nothing like the burning experienced in an ordinary log fire. The water flame is not hot and it is quite possible to hold your hand just over the flame without feeling any heat from it. We do not want to “burn” the liquid in the Cell. The “conditioned water”, for want of a better description, is not consumed when a Cell powers an engine. Instead, the engine is powered by external energy flowing into it. Here, the Cell acts like a lens, concentrating the external energy and focusing it to flow along the aluminium pipe to the engine. This action is not unlike the way in which a magnifying glass gathers and concentrates the sun’s energy into a small area to raise the temperature there. The “conditioned water” in the cell, along with the materials and shapes in the Cell, cause the gathering and concentration of this external energy and channel it into the engine. At this point in time, nobody knows for sure, what the energy is. Earlier, I called it the Zero-Point Energy field, but I have no direct evidence for that, some people call this energy “orgone”. Nobody knows exactly how this energy makes the engine run. Engines powered by this energy sound pretty much the same as when they are running on fossil fuels but they run a lot colder and it is usually necessary to advance the timing of the spark. These engines can tick over at a much lower rate than normal and they have much greater power than when running on fossil fuels. Anyway, how do we get “conditioned water”? It can be generated inside the Cell, but as the conditioning process usually generates an unwanted residue on top of the water and on the bottom of the Cell, there is an advantage to do the conditioning in a separate container. If water conditioning is done in the Cell, then when the residue is removed, the Cell does not have the correct amount of water and needs to be topped up. That has to be done with non-conditioned water which promptly puts the Cell back to square one. So, use a separate conditioning vat which contains considerably more water than the Cell needs. In the documentary video produced by Peter and Joe, the conditioning procedure is described in some detail. Joe explains that he conditions the water by suspending an electrode array in the water and applying 12 volts DC to it. Using the water found local to Joe, the current is initially about 10 amps and if left overnight the current drops to anywhere between 2 amps and 4 amps. This indicates that his local water contains a large amount of dissolved material since completely pure water will carry almost no current when 12 volts DC is placed across it. It is almost impossible to get pure water as so many things dissolve in it. Raindrops falling through the atmosphere pass through various gasses and some of these dissolve in the droplets. If the pollution in the atmosphere is particularly bad, then the rain can become acidic and this “acid rain” can rot the trees and vegetation on which it falls. Water on and in the ground, picks up chemical elements from nearly everything with which it comes in contact, so water, any water, needs treatment to reach its “conditioned” state. The electrical straps connecting to the cones are insulated to prevent contact with either the other cones or the inside of the metal drum which Joe uses to hold the water being ‘conditioned’. He says that if this array is suspended in a tank of water (his happens to be a vertical metal cylinder - a significant shape) and provided with 12 volt DC electrical power for a few minutes, then the water becomes ‘charged’ as he expresses it. Although the water is supposedly clean, Joe gets gas bubbles coming off the surface of the water. These will explode if lit, so it is very important that this process is carried out in the open air and there is no possibility of the gas ponding on a ceiling. 1. A vertical stainless steel cylinder, with an open top, is obtained and filled with water. Joe uses a steel beer keg but he selects the keg very carefully indeed from a very large choice of kegs, and then cuts the top off it. There is no need to have such a large container, or cones as large as the ones which Joe uses. 2. The array of cones is suspended vertically in the middle of the water and 12 volts applied to it. The Cell is most definitely not any form of electrolyser and should never be confused with one. An electrolyser operates by breaking water down into hydrogen and oxygen gasses which are then used for combustion inside an engine, and it requires rapid and continuous replacement of the water which gets used up as the engine runs. The Joe Cell never operates in that way, instead it channels outside energy through to the engine and the water inside a Joe Cell is never used up by the engine running. However, in this conditioning process, some hydrogen and oxygen are produced as a side effect of the purification process. Consequently, the conditioning should be carried on out of doors to prevent any hydrogen ponding on the ceiling and forming an explosive mixture there. The more impure the water, the higher the current which flows and the greater the unwanted electrolysis of some of the water. 3. The procedure for applying the 12V supply to the conditioner electrodes is unusual. First, connect the negative supply, and only the negative supply. After 2 to 20 minutes, make the positive connection for just 2 or 3 minutes. A residue of impurities will form from this process. Some, being lighter than water, rise to the surface and form a layer there. Some being heavier than water, sink to the bottom. The surface residue is removed and the process repeated until a surface layer no longer forms. This may take 24 hours. The clean water from the middle section of the container is used to fill the Cell. Many people are of the opinion that a current of about one amp should flow through the conditioning vat in the early stages of the process. If the current is much less than this, then it may take a considerable length of time to get the processing completed - possibly one or two weeks if the water needs a good deal of work done on it. The process can be speeded up by using higher voltage, 24 volts or 36 volts by adding extra batteries or using an electronics bench power supply. The water can also be pre-processed by placing it in a glass jar in an orgone accumulator for a day or two, but that process is outside the scope of this description. As the impurities get ejected from the water by this process, the electrolysis element gets stifled progressively and as a consequence, the current drops. As completely pure, molecularly-reconfigured water is the goal, no additives of any kind are normally added to the water used to fill the Cell. However, if citric acid is used to clean the cylinders before assembly, there is no harm in allowing them to be assembled in the Cell with traces of the acid on them. The Cell is filled to just under the level of the top of the inside tube array. This is very important as we need to have separate cylinders of water divided by the steel cylinders. If the water level is over the top of the cylinders, then the whole charging arrangement is destroyed. Further water conditioning inside the Cell may be needed as the cylinders also need to be conditioned. This is done with an easily removable cover replacing the lid of the Cell. The Cell should be kept covered while it undergoes its further conditioning and the lid only lifted briefly to examine the bubbles (unless a glass lid is used). The positive connection to the cell is made to the outside of the 5-inch cylinder and at the top of the cylinder. A length of copper wire tightened around the top of the cylinder is a convenient way to make the connection to the outside (and only the outside) of the cell. Place the cell on a wooden workbench or failing that, on a sheet of high-density plastic such as a chopping board. Connect the negative wire and wait two minutes before connecting the positive wire. The Cell is ready for use, when it continues to produce surface bubbles for hours after the 12 volt DC power supply is removed from the Cell. The bubbles produced are not part of the energy-focusing process and are themselves unimportant, but they act as an indicator of the outside energy flowing through the Cell. When the Cell is running correctly, the flow of outside energy is sufficient to keep the water in its conditioned state without the need for any external electrical supply. It also maintains its own energy flow through the Cell. There is no point in proceeding any further until the Cell has reached its self-sustaining condition. If it is not happening for you, check out the information in the “workarounds” section below and if that does not get your Cell operational, ask for advice and assistance through the Yahoo groups mentioned above. Some people concern themselves with the pH of the water. The pH really is not important as the cell will take up the correct pH as conditioning proceeds. A cell of the type described in this document, will have water which is very slightly acid with a pH of about 6.5, but it is not important to know this or to measure it. Do not put litmus paper in the cell water as that will contaminate the cell. Just rely on the action of the bubbles to determine how the cell conditioning is progressing. The mounting details depend on the layout of the engine compartment. The really essential requirement is that the aluminium pipe running to the engine must be kept at least 4 inches (100 mm) away from the engine electrics, radiator, water hoses and air-conditioning components. The last four inches or so, of the tube going to the engine cannot be aluminium as that would cause an electrical short-circuit between the (occasional) positive outer connection to the outside of the Cell and the engine itself which is connected to the battery negative. To avoid this, the final section of the pipe is made using a short length of clear plastic piping, forming a tight push-fit on the outside of the aluminium tube and on the connection to the intake of the engine’s carburettor. There should be a 3/4 inch (18 mm) gap between the end of the aluminium pipe and the nearest metal part of the carburettor. If it is just not possible to get an airtight fit on the intake to the carburettor and a hosepipe clamp has to be used, be sure that the fitting is non-magnetic stainless steel. If such a fitting cannot be found, then improvise one yourself, using only 316L grade stainless steel. In the installation shown above, you will notice that the aluminium tube has been run well clear of the engine components. A vacuum gauge has been added but this is not necessary. For the early stages of installation, the aluminium pipe runs to the vacuum port of the carburettor but stops about 3/4 inch (20 mm) short of it, inside the plastic tubing. This method of connection is advisable for the initial setting up of the vehicle modification. At a later date, when the engine has been running with the Cell and is attuned to it, the Cell operates better if the pipe is connected to one of the bolt heads on the engine block, again using the plastic tube and a gap between the aluminium tube and the bolt head. Some people feel that a safety pressure -release valve with a safe venting arrangement should be used if the pipe feeding the engine, terminates on a bolt head. The Joe Cell is not a ‘turnkey’ system. In other words, just building a Cell and installing it in the vehicle is not nearly enough to get the vehicle running without the use of a fossil fuel. Some adjustments need to be made to the timing and the engine has to become ‘acclimatised’ to the energy. Mount the Cell in the engine compartment and connect the Cell to the battery negative. After two or three minutes, take a lead from the battery plus and touch it briefly to the lid of the Cell. This should produce a spark. Repeat this until four sparks have been produced. This ‘flashing’ process aligns the Cell electrically and directs the energy to flow in the direction of the metal which has been ‘flashed’. The next procedure is dangerous and should only be carried out with the greatest of care. The engine crankshaft also needs to be ‘flashed’ four times. This is carried out with the engine running and so can be hazardous - take extreme care not to get caught up in the moving parts. Connect the lead from the battery positive to the shaft of a long-handled screwdriver and keep your hands well clear. The procedure is to get a helper to start the engine, then arc the current to the exposed pulley on the crankshaft (where timing adjustments are made). There should be a total of four sparks to the crankshaft in a period of about one second. Next, for three or four seconds, flash along the length of the aluminium pipe. This encourages the energy to flow along the pipe, reinforcing the natural attraction between aluminium and this energy. Remove the wire coming from the battery positive as the Cell operates with only the negative side of the battery connected (remember that this is NOT electrolysis and the cell just directs the unseen energy into the engine). Mark the present position of the distributor cap. Loosen the bolt holding it in place and rotate it to advance the timing by 10 degrees. Disconnect the fuel to the carburettor (do not use an electrically operated valve for this). The engine will continue to run on the fuel left in the carburettor and the engine will start to cough. Turn the distributor cap a further 20 degrees (that is now a total of 30 degrees from its original position) and have your helper use the starter motor to assist the engine to keep turning. Rotate the distributor cap to further advance the spark until the engine starts to run smoothly. There will be a gasping sound and the engine will slow nearly to a stop, then it will pick up again and then slow down. The action is wave-like, something like breathing. Fine-tune the timing to get the smoothest running and then fasten the distributor cap in place. Do not touch the Cell, but leave it undisturbed. You are now ready to drive away in a vehicle which is not using any fossil fuel. The procedure described here may not end successfully as just described. Some cars are more difficult to get operating on a Cell than others. Experience helps enormously when getting the vehicle started for the first time. Joe mentions in the video that it has taken him a couple of days of sustained effort to get a particular car going for the first time, which is quite something considering that he has years of experience and has got many vehicles and Cells operational. When the vehicle has been run and is operating correctly on the Cell, it is time to make the final adjustment to the set-up. For this, the pipe connection to the vacuum inlet of the carburettor is moved from there to terminate on a bolt head on the engine block. The Cell works best when completely sealed off from the air in the engine compartment and as no gas is actually being moved from the Cell to the engine, there is no need for any kind of connection to the carburettor. If the engine is a V-type, then the bolt head chosen should be one in the valley of the V, otherwise, any convenient bolt head on the head of the engine block will be satisfactory. Don’t forget that the connecting pipe must still be kept well clear of the engine’s electrical leads and other fittings as described earlier. Also, the 3/4 inch (18 mm) gap between the end of the aluminium pipe and the top of the bolt head must be maintained inside the clear plastic tube, and the pipe fitting should remain airtight. A slight timing adjustment may be necessary with the new connection in order to get the very best running. The energy which powers the engine has a tendency to run along magnetic fields. Driving under high voltage overhead power lines can position the vehicle in an area where the energy level is not sufficient to maintain the energy flow through the Cell. If the energy flow through the Cell is disrupted, then it is likely to stop functioning. If this were to happen, then the Cell would have to be set up again in the same way as for a newly built Cell which has never been used before. This can be avoided by attaching an AA (“penlight”) dry cell battery across the Cell with the battery plus going to the lid of the Cell. A battery of this type has such a high internal resistance and so little current capacity that no significant electrolysis will take place on the very pure conditioned water in the Cell. But the battery will have the effect of maintaining the integrity of the Cell if it is temporarily moved away from its source of power. If it is not possible to get pipes of the desired diameters, then they can be made up by rolling stainless steel sheet and using a TIG welder with completely inert gas, to tack weld at each end and in the middle of each cylinder. Don’t weld along the full length of the join unless it is the 5-inch outer casing. If it is found to be particularly difficult to make the four circular cuts in 1/8 inch (3 mm) steel using hand tools, then I would suggest using a plasma cutter. Make a template to guide the cutting head and clamp it securely in place. You can hire the cutter and compressor quite cheaply as you will only need them for a very short time. If they are not given to you as a pair and you have to select each from a range, take the smallest cutter and a twin-cylinder compressor rated at nearly double the input quoted for the cutter. This is because the cutter is rated by the volume of compressed air, and the compressors are rated by the volume of their uncompressed air intake as that sounds more impressive. If no lathe is available for machining the base plinth for the central cylinder, then take a piece of 16-gauge stainless steel sheet and cut the plinth out of it as shown below. Bend the projecting tags upwards by holding each tag in the end of the jaws of a vise and tapping the body section square, with a flat-faced hammer and if you consider it necessary, tack-weld the top of the tags to the outside of the central cylinder to give rigidity to the mounting. Extreme heat such as is generated by welding or cutting tends to create permanent magnetism in any ferrous metal being heated, so avoid high temperature operations such as welding wherever possible. If a tight push-fit can be obtained with the base of the 2-inch cylinder, then I suggest that the optional spot welds are omitted. If tack-welded cylinders have to be used, then it is usually best to line all of the seams up as the seam area does not work as well as the remainder of the tube, so if the seams are all aligned, then there is only one small line in the Cell which is not operating at its optimum value. Cylinders are best aligned in the same direction. This sounds odd as they are physically symmetrical. However, these cylinders will be used to channel an energy field and each cylinder has a direction along which the energy flows best. To find this, stand all of the tubes upright in a tight group on a table. Leave them for a minute and then place your hand on top of the whole set. If any tube feels hotter than the others, then it is out of energy alignment with the rest and should be inverted. Repeat this test until no tube feels hotter than the rest. The curved bend in the brass welding rod helps to prevent the rod fouling the top of the plastic tube handle and it allows free rotation of the brass rod. It is essential that the rod can move completely freely in the handle. If two of these are made up, they can be used to check the cylinders before they are assembled for insertion into the Cell. Place a tube standing vertically on a table well away from all other objects (especially magnetic and electrical items). Hold an L-rod handle in each hand so that the rods are parallel in front of you. The rods must be exactly horizontal so as to avoid any tendency for them to turn under the influence of gravity. Approach the cylinder. The rods should either move towards each other or away from each other as the cylinder is approached. Repeat this procedure at least three times for each cylinder so as to be sure that a reliable result is being obtained. Invert any cylinder if necessary, so that every cylinder causes the rods to move in the same direction. Then assemble the Cell, maintaining that alignment of the cylinders during the assembly. 1. Take a 12V lead-acid battery and position it so that it’s negative terminal is pointing towards East and it’s positive terminal is pointing towards West (i.e. at right angles to the Earth’s magnetic field). 2. Attach a lead from the battery negative to the outside of the base of the tube. 3. Lay the tube on a table and strike it with a hammer along its length. If the tube has a seam, then strike the tube along the length of the seam. 4. Connect a lead to the positive terminal of the battery and spark the inside of the top of the tube. It is essential to spark each tube if they have been polished. It is better not to polish any of the tubes. 5. Repeat this procedure for each tube. 1. Put the battery positive on the inside of the top of the cylinder, and the negative on the outside at the bottom, and leave them in place for one minute. 2. Put the negative on the inside of the top of the cylinder, and the positive on the outside at the bottom, and leave them in place for one minute. 3. Repeat step 1: Put the battery positive on the inside of the top of the cylinder, and the negative on the outside at the bottom, and leave them in place for one minute. Do this for all cylinders, working inwards. It has been suggested that an improved method of conditioning water to fill the Cell can be achieved if pulsed DC is used instead of straight DC from a battery. This has not been proven but there is a reasonable amount of information to suggest that this is likely. The following, most unusual circuit, has been suggested, but it must be stressed that it is untried and anybody who is unfamiliar with working with electronics should not attempt to construct or use this circuit without the assistance of a person who is experienced in building and using mains equipment. This is a most unusual circuit. A 12V step-down mains transformer provides 12V AC which is taken through a limiting resistor and a zener diode which would not normally be connected as shown. The really odd thing is that the circuit which contains the secondary of the transformer appears not to be connected. The expected output from this very odd circuit is pulsing DC of odd waveform, all of which is positive relative to the ground connection, which is a literal, physical connection to an earthing rod driven into the ground. Engines running while powered by a Joe Cell act in a somewhat different manner. They can idle at a very low number of revs per minute, the power available on acceleration is much greater than normal and they appear to be able to rev very much higher than ever before without any difficulty or harm. Well, all I can say is "who needs an Indy car when you can drive an old FORD" – WOW!!!! The first five miles after leaving home were wild. I had to be extremely careful on how I pressed the accelerator. I gingerly crept up to 45 mph and that was with moving the pedal maybe half an inch. The throttle response was very crisp or touchy. With about a 1/8" of movement the next thing I new I was close to 80 mph. If I lifted off ever so slightly on the throttle, it felt like I was putting the brakes on and the speed would drop down to 30 mph or so. "Very erratic". If I barely even touched or bumped the pedal it felt like I had pushed a nitrous oxide booster button. WOW !!! As stated earlier, the first 5 miles were wild and things started to change. The engine started to buck or surge with very large rpm changes and literally threw me against my seat belt. It got so bad I just took my foot completely off the pedal and rode the brakes to stop the truck. The truck left skid marks on the pavement every time the engine surged in rpm. Well anyway, I manage to get it stopped and shut it off with the ignition key - thank GOD ! I retarded the timing, turned the gasoline back on, crossed my fingers and hit the ignition key, and the engine took right off, revving to maybe 4,000 rpm and then gradually decreased to 700 rpm. I took a deep breath and put it into drive and the truck responded close to normal again. I made it into work a little late, but late is better than never the way I see it. After working during the day at the job and thinking what I could do to stop this erratic rpm oscillation, I decided to disable the cell and drive home on gas. WOW !!! Peter Stevens states that the main reason for the erratic behaviour of the Cell was due to outside air leaking into the Cell, and he stresses that Cells need to be completely airtight. It is also clear that the timing was not set in the correct position. All properly built Cells give enhanced engine power. Please be aware that water quality and purity varies enormously from place to place. One experienced cell builder says: I use water taken from the start of rivers. Further down the river, the water will have encountered influences which are not helpful. My favourite water catchment area well is outside Melbourne, Australia, where there are no roads, power lines, dams, pipes or any man made intrusions, the water flows how and where it wants to in natural, twisty downhill paths it has created, the whole area is green all year round and you can feel the vitality and Nature at work. This water has a pH of 6.5. That means it is slightly acidic, and perfect for Joe Cells. I bring this water home making sure that I protect it from excessive sloshing and the heat of the sunlight whilst in the car. At home, I store it in 20 litre Pyrex bottles. Do not store it in plastic containers even if the container is marked "suitable for water". Earthenware or wood containers would also be very suitable. I make an electrolyte solution by dissolving 500 grams of food-grade phosphoric acid and 100 grams of sodium perborate, in three litres of de-ionised water or distilled water. Just a few drops of this solution will provide a current of 1 amp at 12 volts in the conditioning vat. An alternative is to use a 90% acetic acid solution which has no stabiliser in it. When conditioning the water in the cell, you will need a lid, or some way of sealing of the cell from air. A lid loosely sitting on top of your test jar is sufficient. The seeding and breeding process is hampered by having too great an area of the top of the cell being exposed to air. All lids are not the same as regards to being a obstruction to orgone. If the lid does not seem to be working, place a layer of aluminium foil underneath the lid and use the foil and lid as one unit. The aim is to modify the conductivity of the water by the addition of acid, so as to get a suitable current flow. If we used de-ionised water with a pH of 7.0, we would have a very low current flow for our electrolysis, and would have to add something to increase the conductivity of the water if we wanted observable results in a short period of time. As we lower the pH, the current flow and electrolysis process will increase together with a heat increase. We are trying to achieve electrolysis action with the minimum heat generation. As the propagation of orgone is reasonably slow, there is not much to be achieved with excessive current. Slow and steady does it. For the patient experimenter or one that is using neat water, i.e. water without electrolyte, excellent results are achieved with currents as low as 50 milliamps. 1. Place your cell on a wooden work bench or on a sheet of plastic type material or, as a last resort, on a newspaper. We are trying to insulate the cell from metal paths that may impede the seeding process. Keep the cell well away from electrical sources such as a television set, refrigerator, electric cooker, etc. 2. With a multimeter, measure the resistance between the innermost and the outermost cylinders of your cell. It should be in the high Megohm range. If not, the insulators are conductive or there is a short-circuit. Check for a short-circuit and if there is none, remove the insulators and reassemble the set, checking the resistance between the innermost and outermost cylinders as each cylinder is added. The resistance between every pair of cylinders should be very high. 3. When all is okay in the above step, fill the cell using a funnel containing a paper coffee filter. Fill it only to a level just under the top of the cylinders and no more. The effect that we want to create is a set of water cells separated by metal cylinders. These are your alternate organic and inorganic chambers. Of course, the submerged section of you chambers are flooded, but with this simple cell, the top will be doing all the work. This is why the cylinders should be completely horizontal and true at the top, otherwise the meniscus formed by the water would not work and the water would flow from compartment to compartment. This level is only critical during the seeding process, as we require maximum orgone capture to seed the cell. Naturally, with a charged cell, the water is sloshing all over the place whilst you are driving the car. 4. Turn on the power supply, and if it is adjustable, set it to 12 volts. Connect the negative end of your power source to one end of your meter that is set up to read a minimum of 2 amps and connect the other end of the meter to the bottom of the central cylinder. Wait for two minutes and then connect the positive end of your power source to the top of the outer cylinder. What you have done is set up the meter to read any current flow into your cell from the power source. At this stage, if your water is close to a pH of 7, as previously discussed, the current flow will be zero, or in the low milliamp region. If the current flow is amps, then you are doing something wrong! It is impossible to pass a huge current through ordinary pure water when using 12 volts. Think about it. To draw even 1 amp at 12 volts, the resistance of the water would have to be 12 ohms! No way! You are doing something wrong. Correct the problem and then move on. 5. Presuming that the current is only milliamps, you now want to introduce electrolyte to increase the current flow through the water. The aim is to get a current flow of about one amp. To do this, drip a small amount of your chosen electrolyte into the cell water whilst stirring and watching the current measurement. Use a glass, Perspex or wooden dowel rod as the stirrer - do not use your handy paint-stirring screw driver! Throw away the stirrer when finished as it will have absorbed some of the cell contents. Do plenty of gentle stirring of the water as you add the electrolyte, otherwise you will add too much electrolyte. Stop adding electrolyte when the meter indicates 1 amp. Your water level may rise as a consequence of the addition of electrolyte. Remove some water from your cell. I use a pipette, so as not to disturb the cell. Remove enough water to again just expose the top of the cylinders. At this stage, disconnect your meter and power source and have a bit of a clean up as the next stages are guided by observation. The charging process is separated into three distinct stages which are called Stages 1, 2 and 3. These stages have both some obvious differences and some subtle ones. For the rest of the charging process, you will be only connecting your power source to the cell for a maximum of 5 minutes at a time. As orgone lags electricity by about 30 seconds, you will know the state of the cell in less than a minute. Do not be tempted to leave the power connected to the cell for long periods! Yes, I know that you are in a hurry and more is better, but in this case you only generate heat, steam, waste power and overheat the cell. You can pick the failures by seeing their cells running non-stop for days with 20 or more amps turning the water to steam, etching the cylinders and ending up with a barrel full of scum. What else would you expect? After all, electrolysis is time and current related. If you have had the misfortune of having your cell left on for a long period with high current, you have probably destroyed your cylinders. You cannot retrieve the situation so throw the cell away and start again. I bet you don't do it next time! Danger: Do not charge any cell that is totally sealed! The cell will explode, with all the resulting consequences. An airtight seal is not required ! At no stage do I prescribe any form of airtight container. Stage 1: This stage is plain old electrolysis. Due to passing direct current through a liquid which contains ions, chemical changes will occur. In our case, you will see small bubbles and a cloud of activity that is greater nearest the outside of the innermost negative cylinder. The important observation points are that the activity is greatest nearest the central cylinder and gets progressively less as we move outward via the different chambers formed by the rest of the cylinders. Also, within a short period of turning the power off, all activity stops, the water becomes clear and the bubbles disappear. Every fool and his dog can reach Stage 1. The secret for progressing further is to restrain your impatience and not increasing the electrolyte concentration to raise the current (and/or leaving the cell on for days on end). Be patient, leave the cell on for no longer than 5 minutes, turn the power source off, remove the leads to the cell, and put the top on the test cell, or partially block off the exit of the car cell. It does not have to be airtight! Go and do something else. It is like waiting for a tree to grow from the seed. Do this on a daily basis for days, or a week, or longer, until you get to Stage 2. You will find that the more "alive" the water is , the quicker is the seeding of the cell. I have found that the storage, age, and source of the water all affect the seeding speed. I have also found that by changing the structure of the water by various means e.g. vortexing, shaking, filtering, etc., you can greatly enhance the water quality to make it more "alive". Stage 2: You will now notice on your initial powering up of the cell, that the bubbles are getting larger and the white cloud of tiny bubbles in the water are much smaller or more transparent. Also in Stage 1, you had the action occurring mainly near the central cylinder. Now the bubbles form in a regular fashion irrespective of their location in the cell. More importantly, on turning the power off from the cell, the bubbles do not go away immediately but stay there for minutes rather than seconds as in Stage 1. Also, the top of the water assumes a glazed look and the meniscus is higher due to a change in the surface tension of the water. At this stage you may have some brownish material amongst your bubbles. Don't panic - it is only the impurities being removed from the cell. I find that if I wipe the top surface of the water with a paper towel, the bubbles and the deposit will adhere to the paper and can be removed easily. Top up the cell with water from your charging vat, if required, after the cleaning, so that again, the top edges of the cylinders are just showing. No more electrolyte is added! In cleaning the top of the cell as described, it has been observed that some people react unfavourably with the cell. If so, keep that person away, or if it is you, try changing your hand i.e. use your right hand instead of your left or vice versa. If the presence of your hand seems to collapse the surface bubbles, I would suggest you get a friend to do the work for you. Summary of Stage 2: The result is very similar to Stage 1, but now we have a more even bubble distribution and an increase of surface tension and a longer presence of the bubbles when the power is turned off. There will be no scum in the bottom of the cell and the water will be crystal clear. At this stage the orgone has seeded the cell, but as yet, is not “breeding”, that is, the orgone concentration is not yet great enough to attract additional orgone flow to itself. With the right cell, water and operator, it is possible to go straight to Stage 2 on the first turn on of a new cell. Stage 3: Not many people get to this stage, or what is worse, get here incorrectly. If you get here following the above steps, your water is still crystal clear with no deposits in the sump. If you get here by brute force, you will have stripped appreciable amounts of material from the cylinders and this material will now be deposited on the insulators and suspended in the water as tiny particles which never settle out, and finally, the material will form a deposit at the bottom of the cell. The low resistance insulators and the metallic particles in the water will create a cell which leaks orgone and consequently it will cause endless mysterious car stoppages or refusals of the car to start. Right, the miracle of Nature is now breeding in your cell. Upon turning your power on to the cell, within 30 seconds copious beautiful white bubbles will rise from all the surface area of the cell. Before these bubbles cover the water surface, you will notice a slowly rotating and pulsing front in all cylinders, that is synchronised and has a regular rhythm of about 2 pulses per second and a clockwise rotation speed of about 1 revolution every 2 seconds. These effects are very hard to observe for a first time viewer who does not know what to look for. I find it easier to watch these effects with the aid of a fluorescent light, as the 100 cycles per second pulsations of the light "strobe" the water surface and help the observation. The bubbles may overflow the container and show great surface tension. One of the definite proofs that the cell is breeding is that, on turning the power source off and coming back the next day, most of the bubbles will still be on top of the water as opposed to Stage 1 or Stage 2 where they disappear in minutes. There is no way that you can mistake this stage. The bubbles are larger and pure white, the surface tension is greater, the bubbles are pulsating and most importantly the surface tension remains days after the power has been removed. I do not recommend any additional tests or measurements. But for those who are incapable of leaving things be, they may measure the voltage across the cell after it has been left standing with the power off for at least 24 hours. A Stage 3 cell will have a residual voltage, or more correctly, a self-generated voltage of around 1 volt. A Stage 1 cell measured under similar conditions will read 0.1 to 0.2 volts. Remember, that unless you know what you are doing, these voltage measurements can be very misleading due to probe materials and battery effects that can easily mask your true measurement. As the cell reaches the maximum density of orgone that it can hold, the result of the breeding process is the conversion of this excess orgone into the formation of electricity. As such, electrical measurement with the correct instruments is a very valuable method in the verification of the efficiency of the cell. If you are conversant with the work of William Reich, you may care to make an orgone meter and thus remove all guesswork. This meter is fully described on some web sites. I do not recommend any form of bubble exploding. As noted earlier, noise and vibration are orgone-negative. Therefore, these explosions applied during the delicate seeding period will kill your cell. Apart from a dead cell, the chance of fire igniting other gasses in the workshop and injuries to the ears etc. makes this exercise highly unnecessary. I must admit that I too fell for the "go on, ignite it!" feeling. I had a cell that had been at Stage 3 for seven months. It was my favourite test cell. My hands and matches fought my brain and they won. There was a huge "ear-pulling, implosion/explosion", and yes, I killed the cell. It went back to Stage 2 for four days. I will not do it again. As all water we are using so far has been electrolysed, this water is not suitable for use in non-stainless steel or glass containers due to reaction with the container and the resultant corrosion, but if you have to, or want to, you can use juvenile water with no electrolyte added and still charge it to Stage 3. As the ion count is much lower, the water is not as conductive, i.e. you cannot get as much current flow with 12 Volts as you would if you electrolysed the water. However, if you obtain a power supply of approximately 60 to 100 Volts at about 1 Amp, you will be able to charge "plain old ordinary water". The down side is the additional waiting, in some cases, over 3 weeks, and the cost of the fairly expensive power supply. The advantage is that you will be able to pour it into the radiator of a car with no increase in corrosion as compared to water containing acids. Do not at any stage short circuit, i.e. join any of the cell cylinders to each other electrically with your charging leads, wedding ring, etc. If you do, the cell will "die"! Your only option, if this occurs, is to connect the cell to your power source and see if you are still running at Stage 3. If the cell does not revert to running in Stage 3 mode within 1 minute, your only option is to completely dismantle the cell and re-clean and re-charge. Huh?? ?, you are kidding us, right??? No, I am serious, that is your only option! So do not do it, do not short out your cell! You will have similar, but not as severe problems if you reverse your leads to the cell. When the cell is running at Stage 3, you can tip the charged water out of the cell into a glass container and clean, adjust or maintain your now empty cell. Try to keep all cylinders in the same relation that they were in before you dismantled the cell, i.e. keep all cylinders the same way round and in the same radial alignment. This is mainly relevant when dismantling cells over 6 months old as the metal parts develop a working relationship that can be weakened or destroyed by careless re-assembly. When finished, pour the charged water back and you are back in business. Of course you can pour this charged water into other cells, or use it as you see fit, but, remember, do not leave it out of the cell for periods longer than 1 hour at a time as the breeding has now stopped and you are slowly losing charge. 1. The metal construction of the Cell needs to be of stainless steel and nothing else. Using copper or brass, even for something as simple as the connector between the Cell and the aluminium tube running to the engine is sufficient to cause serious problems as the energy is not directed to the engine and just leaks away sideways. 2. The water is best charged in a separate vat which has a larger capacity than the Cell itself. That way, when the Cell is being conditioned and scum removed from the surface of the water, the cell can be topped up with charged water from the vat. If, instead, ordinary, uncharged water is used, then the whole process is liable to be put right back to square one. 3. Be very sure that the mounting in the engine compartment is electrically insulated from the engine and chassis and be sure that there is serious clearance between the Cell and everything else. Also, the aluminium pipe running to the engine must be kept at least four inches (100 mm) clear of the main engine components. Otherwise, the energy which should be running the engine, will leak away sideways and not reach the engine. 4. It can take up to a month to get a steel engine acclimatised to a Cell. Run the engine as a “shandy” where fossil fuel is still used but the Joe Cell is also attached. This usually gives greatly improved mpg, but more importantly, it is getting the engine metal and cooling water ‘charged’ up ready for use with the Joe Cell alone. Once per week, try advancing the timing and see how far it can be advanced before the engine starts to ping. When the timing gets to a 20 or 30 degree advance, then it is time to try running on the Joe Cell alone. (b) Stand on the North side of the battery, facing South. (c) Wet the fingers of your right hand and place them on the battery’s negative terminal (which is on your left hand side). (d) Keep your fingers on the terminal for two minutes. (e) Wet the fingers of your left hand. Place your left arm under your right arm and place the fingers of your left hand on the positive terminal of the battery. Do not allow your arms to touch each other. (f) Keep the fingers of your left hand on the positive terminal for three minutes. (g) Remove your left fingers from the positive terminal, but keep the fingers of your right hand on the negative terminal for another 30 seconds. This procedure is said to align your body with the energy flow and make it much easier for you to get a Cell to “Stage 3” or to get a vehicle engine running. In passing, some people who suffer continuing painful medical conditions state that they have got considerable pain relief from this procedure. One of the greatest problems with using a Joe Cell has been to get it operational. The reason for this has probably been due to the lack of understanding of the background theory of operation. This lack is being addressed at this time and a more advanced understanding of the device is being developed. While it is still rather early to draw hard and fast conclusions, a number of results indicate that there are three separate, unrelated dimensions which are of major importance in constructing a properly “tuned” Joe Cell. It needs to be stressed that these measurements are very precise and construction needs to be very accurate indeed, with one sixteenth of an inch making a major difference. The dimensions are specified to this degree of accuracy as they represent the tuning of the Cell to the frequency of the energy which is being focussed by the Cell. The fact that there are three separate dimensions, suggests to me that there are probably three components of the energy field, or possibly, three separate energy fields. It is suggested that a Joe Cell should be constructed with cylinder heights which are a multiple of either the ‘Golden’ or ‘Blue’ length. Also, the water height inside the container should be below the tops of the inner cylinders and be a multiple of the basic length chosen for construction. The inner cylinders should be positioned the ‘Diamagnetic’ dimension above the base of the Cell. They should also be constructed from stainless steel of thickness 0.06445" (1.637 mm, which is very close to 1/16") and there should be a horizontal “Diamagnetic” gap between all of the vertical surfaces. A suggested Joe Cell design is shown below. This diagram shows a cross-section through a Joe Cell with four inner concentric stainless steel tubes. These tubes are positioned 0.515625 inches (13.097 mm) above the bottom of the Cell and the gap between each of the tubes (including the outer casing) is exactly that same ‘Diamagnetic’ resonant distance. It should be clearly understood that a Joe Cell has the effect of concentrating one or more energy fields of the local environment. At this point in time we know very little about the exact structure of the local environment, the fields involved and the effects of concentrating these fields. Please be aware that a Joe Cell which is properly constructed, has a definite mental / emotional effect on people near it. If the dimensions are not correct, then that effect can be negative and cause headaches, but if the dimensions are correct and the construction accurate, then the effect on nearby humans is beneficial. For the purposes of this example, and not because these figures have any particular significance, let’s say that the steel sheet is 0.06” thick and the outer cylinder happens to be 4.95” in diameter and it is 0.085” thick. People wanting to work in metric units can adjust the numbers accordingly where 1” = 25.4 mm. Then, the inner diameter of the outside cylinder will be its outer diameter of 4.95”, less the wall thickness of that cylinder (0.08”) on each side which works out to be 4.79”. The length of stainless steel needed to form that cylinder will be the circumference of the outer diameter of 3.758” which will be 3.758” x 3.1415926535 = 11.806 inches. Co-axial Cable Electrets. There is a device which is not widely known. It is called an "electret" and I have to confess that my knowledge of them is almost zero. Essentially, an electret is a passive device which pours out electrical energy. I do not know where that electrical energy comes from. The Wikipedia encyclopaedia has some highly technical information on the subject remarking that "tunnel ionisation" is a process in which the electrons in an atom can pass through the atom's potential (voltage) barrier and escape from the atom. In an intense electric field, the potential barrier of an atom is distorted drastically and so the length of the barrier through which electrons have to pass, decreases and electrons can escape quite easily. The atoms spoken of here, might be those of a dielectric which could form an electret. An electret of that type can produce 10,000 volts at 10 milliamps. The current flow of 10 milliamps sounds trivial and of no consequence, but that is not actually the case as the power of 10 milliamps at 10,000 volts is 100 watts, so imagine a 100 watt light bulb brightly lit and not needing any power input at all to make it shine. That is actually, quite impressive. PLEASE NOTE THAT 10,000 VOLTS WILL KILL YOU AND INVESTIGATING A DEVICE OF THIS TYPE IS NOT FOR PEOPLE WHO ARE NOT ALREADY FAMILIAR WITH WORKING SAFELY WITH VERY HIGH VOLTAGES. MEASUREMENTS MUST ONLY BE MADE WITH HIGH-VOLTAGE EQUIPMENT. LET ME STRESS AGAIN THAT I AM NOT ENCOURAGING YOU TO MAKE OR EXPERIMENT WITH ANY FORM OF HIGH VOLTAGE DEVICE AND THAT THIS INFORMATION IS FOR YOUR INTEREST ONLY. Unfortunately, life being what it is, it has been found that when you try stepping that voltage output down to a more convenient voltage, there can be losses which lower the output power to just 50 watts. That sounds disappointing until you put it in perspective. This is a device which has the same output as a 50 watt solar panel in full sunlight, mounted at the optimum angle and positioned near the equator. But, the electret costs far less, produces that full output at any latitude and at night, while the solar panel is restricted by cloud cover, distance from the equator, needs an expensive mounting system, ideally should rotate to track the position of the sun, and only works when there is a high light level. So, the electret's fifty watts of continuous power is not an insignificant thing when you compare it to the other options available. These electrets can be stacked in parallel and an output in the kilowatts range is possible. Let me stress that I personally have not yet made or used a co-axial cable electret, and so the information here comes from an experimenter who has done this. Also, while the information here is intended to help anyone who wishes to experiment along these lines, the fact that it is here must not be interpreted as my encouraging you personally to try to make or use an electret of this or any other type. If you choose to do that, then you do so entirely at your own risk and nobody other than yourself is liable should any mishap occur. Make sure that neither end of the cable has the screen touching the central core. Make an electrical connections to both the screen and the core at both ends of the cable. Place the whole of the spool of cable inside an oven. Heat the oven (a genuine oven and not a microwave) slowly to 350oF (180oC). Maintain the heat until the inner plastic insulation is so soft that it can be permanently indented. This plastic must not get too soft and reach the flowing stage, nor must it get burnt or develop holes which allow arcing - if that happens, then the reel of cable is a throwaway. The objective here is to get the plastic to lose it's polarisation memory. When the inner plastic sleeve has reached this level of softness, apply a steady DC voltage of about 10,000 volts to the connections already made to one end of the cable (to the screen and to the core). Although any voltage from 12V to 20,000V can be used, a 10 mA current draw can be expected when using 10,000V. Maintain this applied voltage at the high temperature for about ten minutes. Turn off the heat and let the oven cool down gradually at its own rate to the 25OC to 30OC region, keeping the high voltage attached to one end of the cable. Connect the cable screen to the central core at both ends of the cable. Leave the cable at room temperature for five to seven days. During this time, the polarisation of the plastic is reorganising. After this time, the electret is ready for use as a power source.